After a million poses, she finally snaps. Her limbs refuse to comply. P.S. We’re in Chiang Khong in northeastern Thailand, on the Mekong River and the border with Laos. 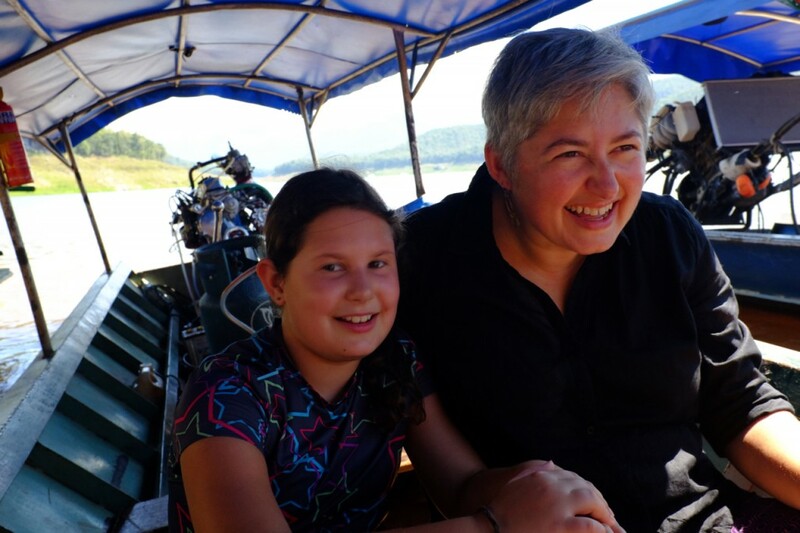 Tomorrow we’ll be crossing into Laos where we’ll catch a boat for a two-day ride down the Mekong to Luang Prabang. More updates coming soon! 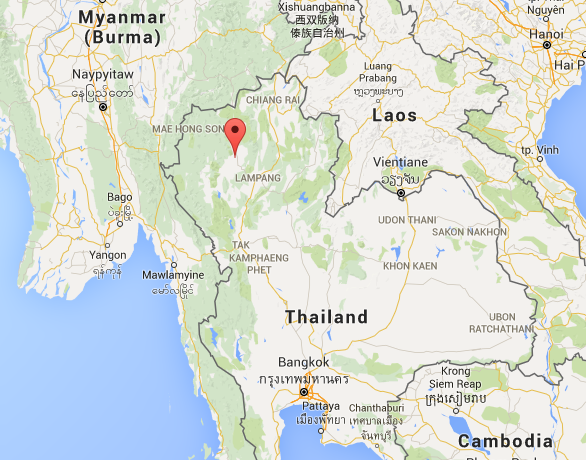 About an hour and half North of Chaing Mai is Si Lanna National Park. 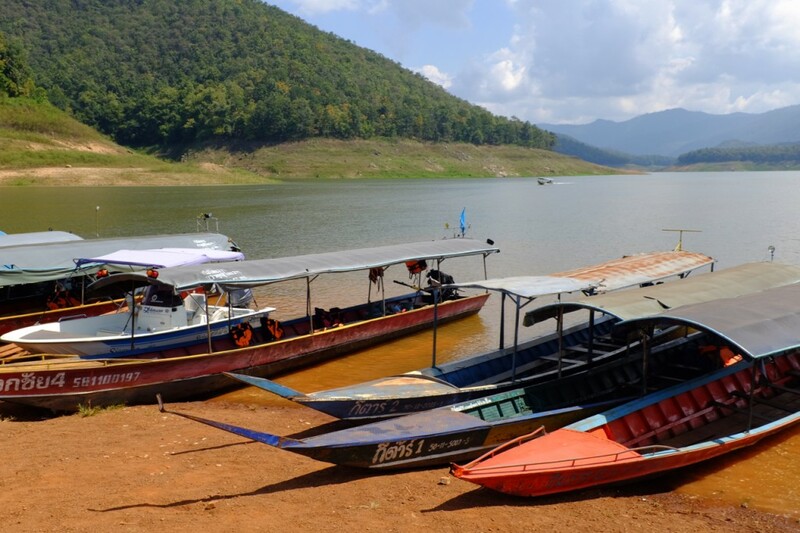 In the park is a large lake called Mae Ngat Somboon Cham, known to many of the locals as “The Dam.” It is a bit off the beaten path and we thought it would be a nice escape for a few days. 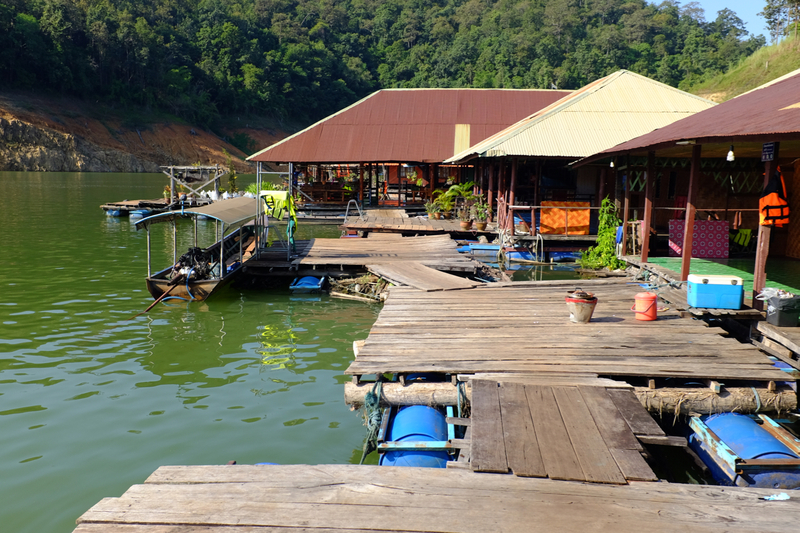 We called around and found a “floating guesthouse” with an opening, hired a songthaew, and headed North. We didn’t know quite what to expect. 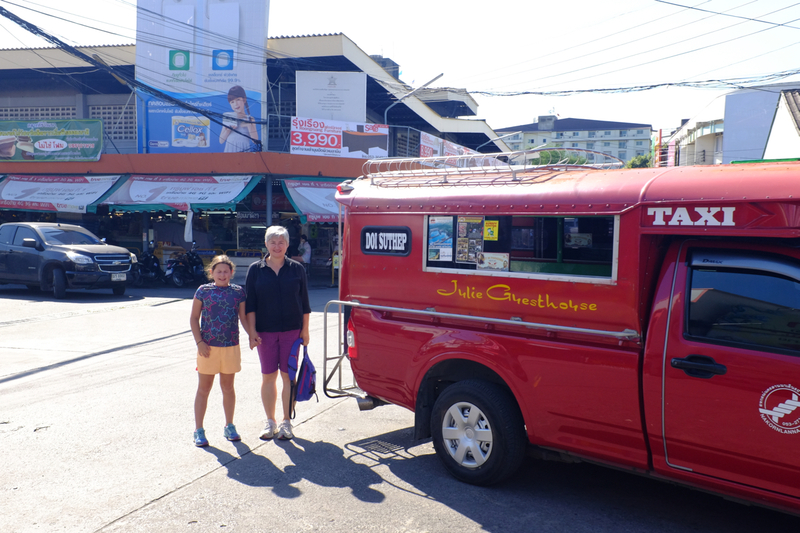 On the way out of town we stopped at a market for a few provisions. We’d read that food at the lake was quite basic and thought it would be good to take some fruit and snacks just in case. We arrived at the lake. 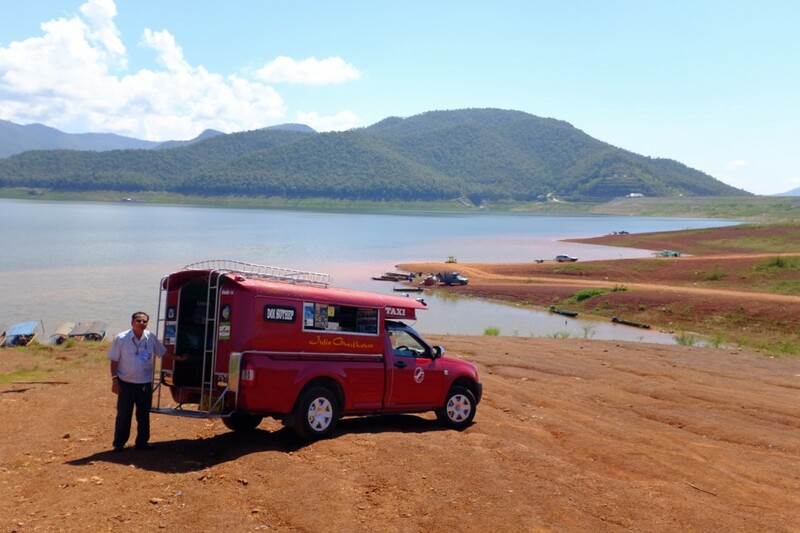 The songthaew stopped right next to the dam in an area where the longtail boats dock for passengers and supplies. 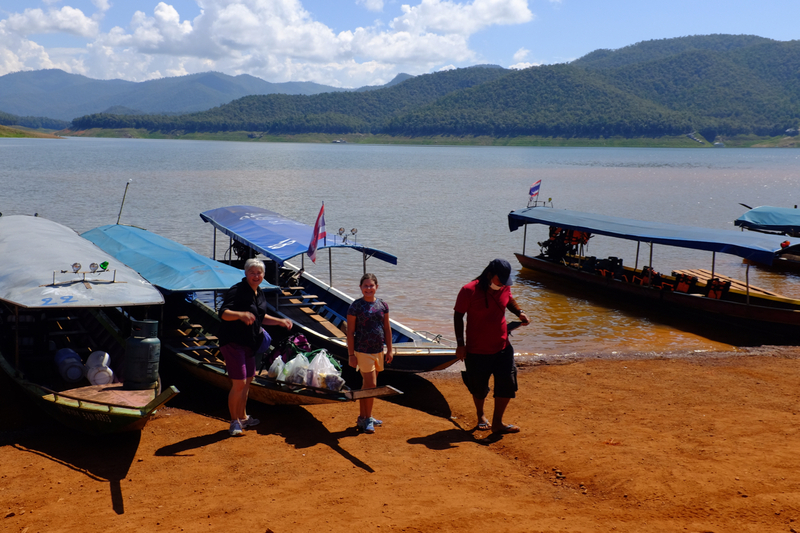 We unloaded our stuff and when our songthaew driver told the guys gathered the name of our floating guesthouse, one of the boat drivers came forward and led us to his boat. We hopped in and away we went across the lake. Ten or fifteen minutes later we pulled up to a group of floating structures – our home away from home. Here’s a rough video of the trip. 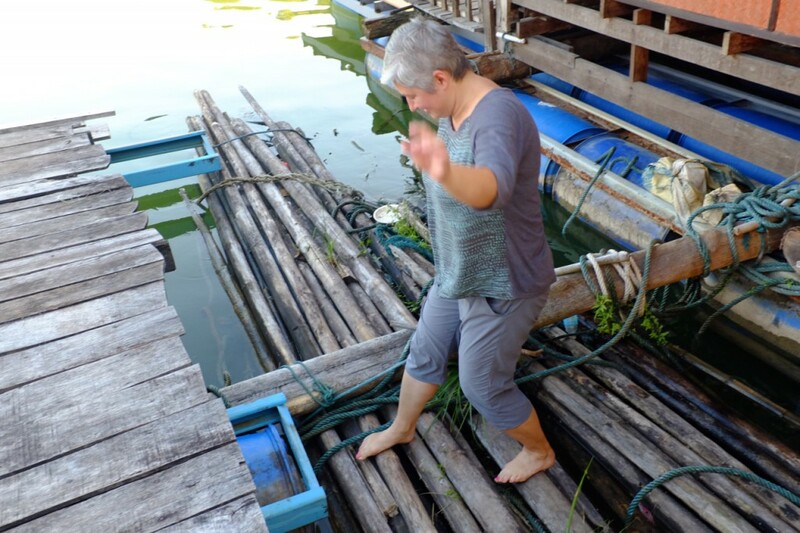 Of course the camera battery died just as we arrived at the floating guesthouse. We need to get a new battery. We unloaded our stuff and checked in with the lady that ran the joint. No one spoke English, which was fine with us. 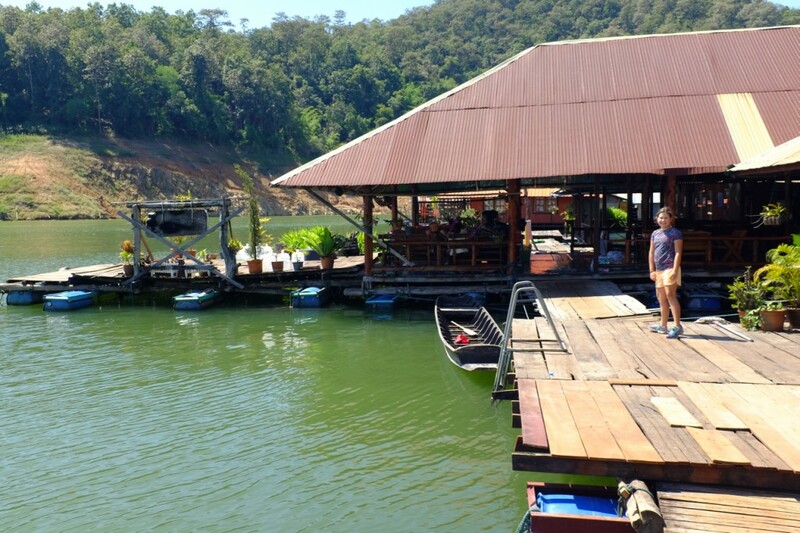 There were about a half-dozen thatched “huts” with tin roofs floating on wooden platforms or decks. They were all linked by wooden decks. 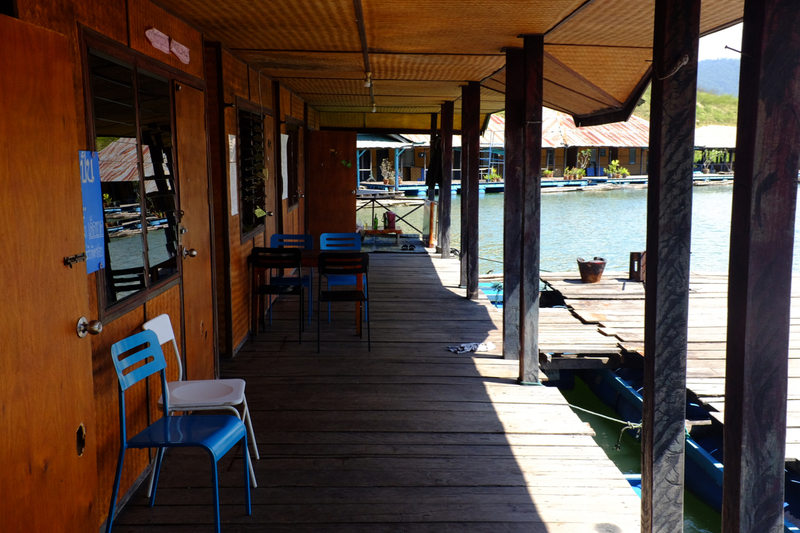 At one end was the office/restaurant which was essentially a big covered porch. We were the only gringos. 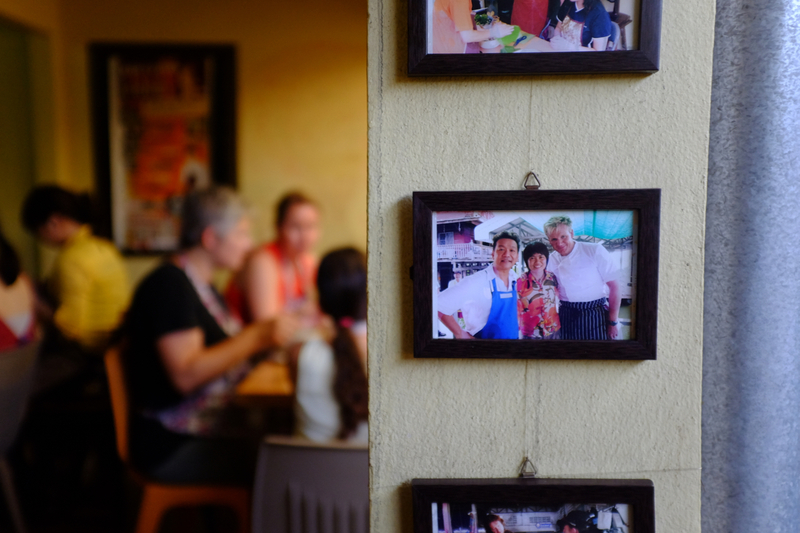 The other rooms were occupied by Thai families or groups of young Thais. We could see the water through the slats of the bathroom floor. 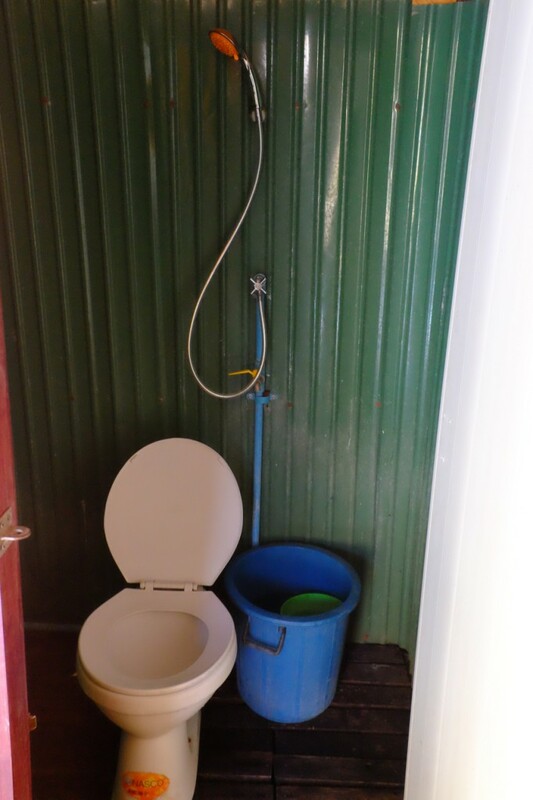 It did look like there was a tank beneath the toilet. That was good. Water for the shower and the flush bucket was from the lake. I never used the shower, I just jumped in the lake! 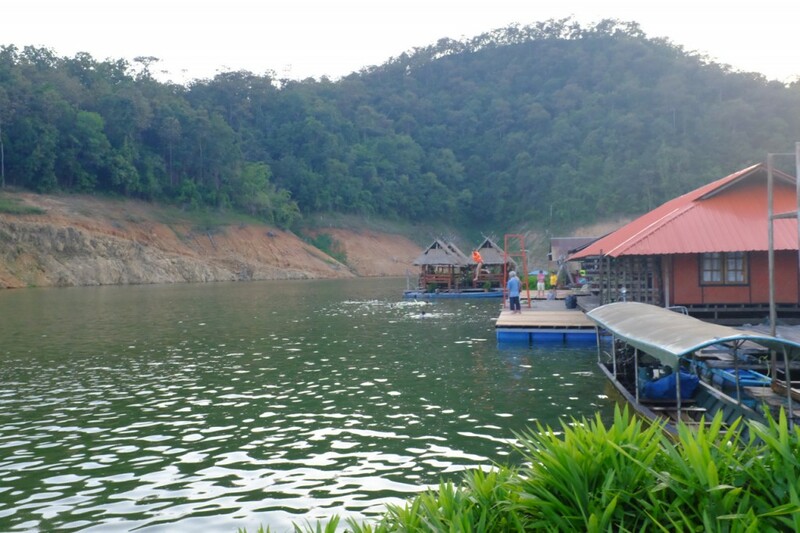 The facilities were very basic but clean, and hey, this is what they should be like on a lake in a national park in Northern Thailand. These are the local rustic cabins! We could swim right off the deck in front of our room, and the water temperature was perfect. 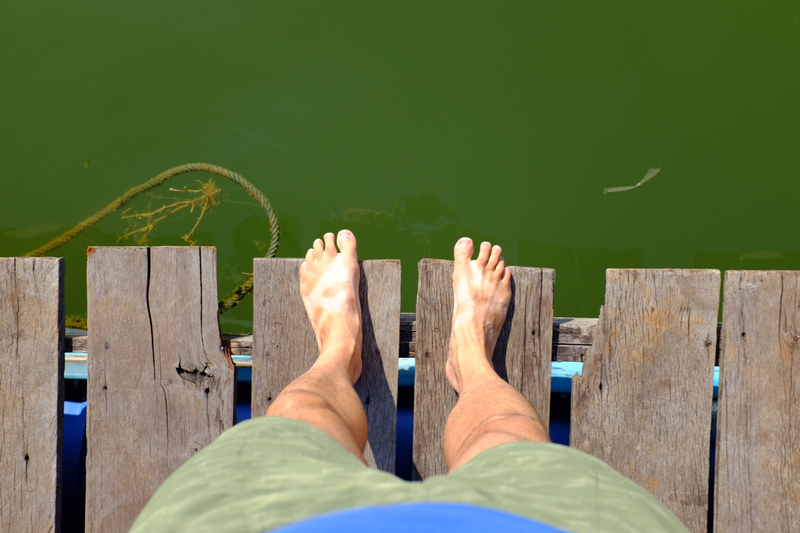 The water was green and somewhat clear. You could see about 4 feet before the green haziness obscured everything. 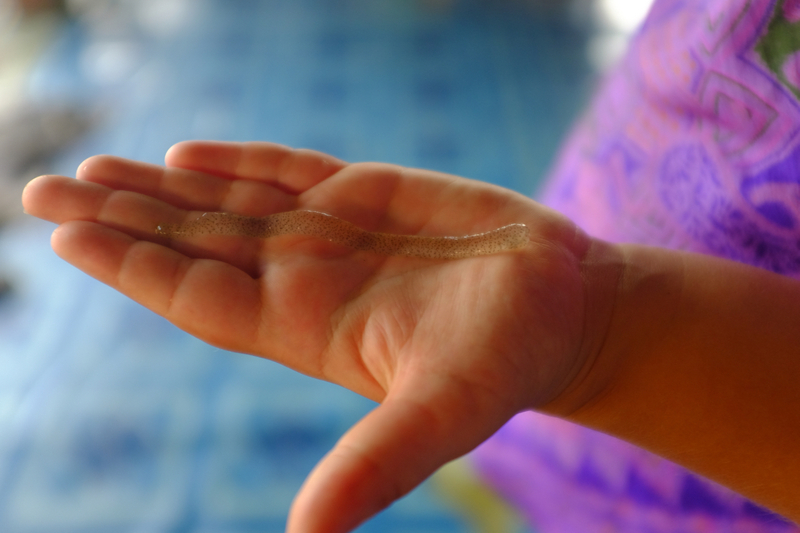 We saw lots of minnows and some bigger fish, but no giant snakeheads, and nothing nibbled our toes. 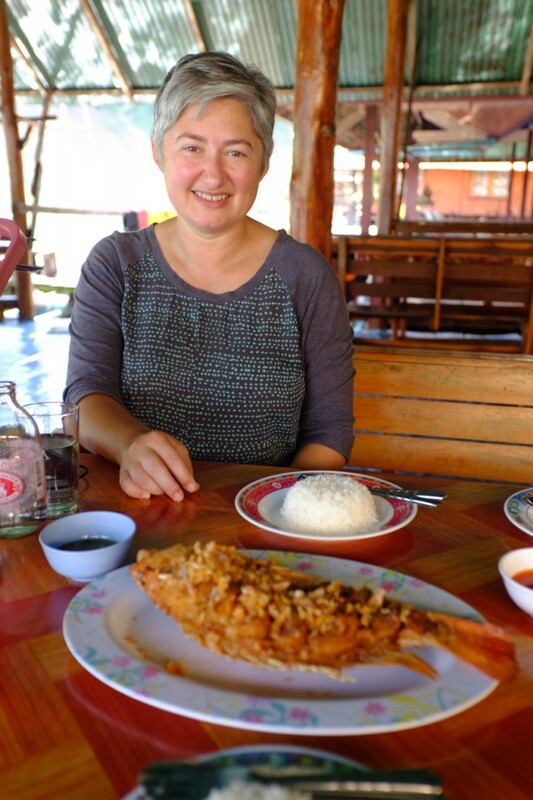 The restaurant had a selection of basic dishes, centered mostly around local fish. 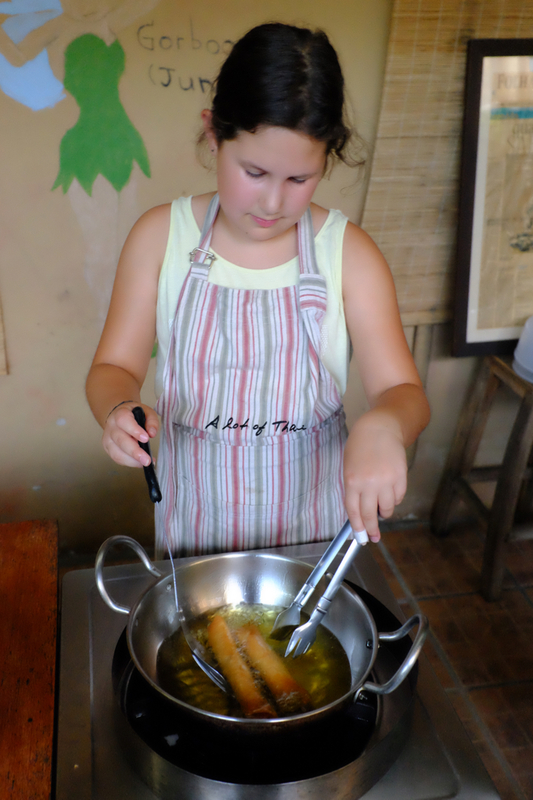 Our favorite was the fish fried with garlic. It was tasty, especially with the lime and hot chilli sauce. We ended up eating it at almost every meal! We relaxed, swam, ate, paddled around in the canoe, read, and did some math. 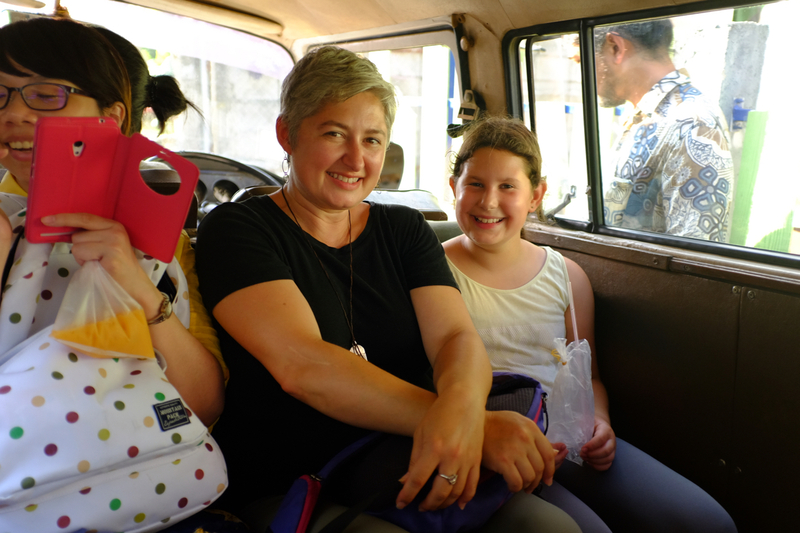 On the second day, we heard voices, kids voices, speaking English. 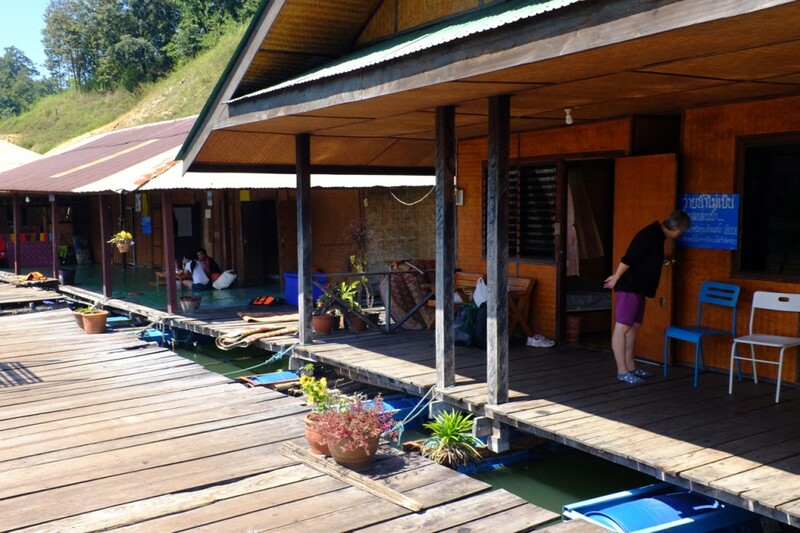 They were coming from another group of guesthouses, next door, so we jumped in the canoe and went to see who it might be. 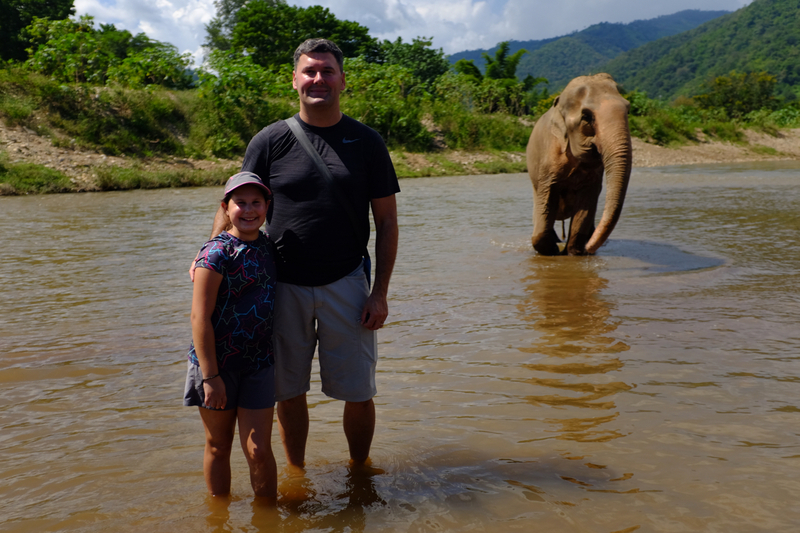 We paddled over and met a couple of really nice Kiwi families who live in Chiang Mai. They too had come to the lake for a couple days of fun and relaxation. Mila and I enjoyed visiting with them, and Jette spent the rest of the day playing with her five new friends. They had a blast, and we barely saw Jette again until sundown! Jette does the high dive. The kids also had a fun time finding frog eggs, which to be found in long, gelatinous tubes stuck to the floats of the guesthouses. 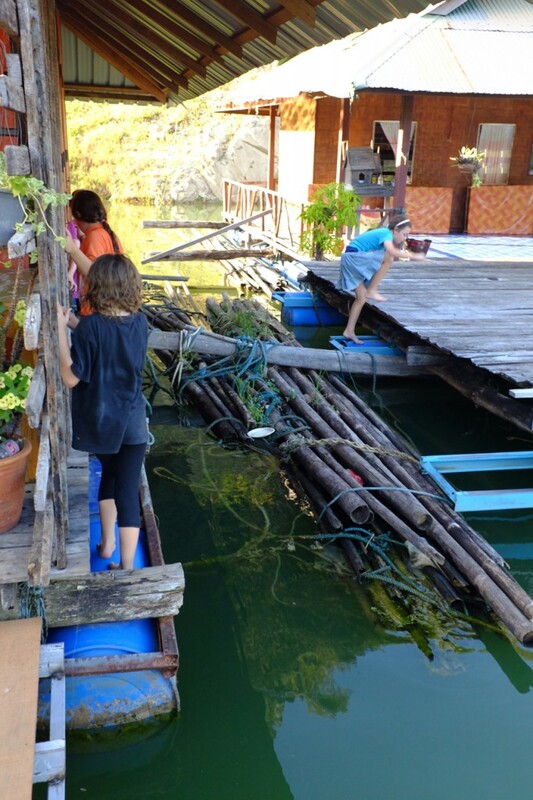 Aside from swimming or the canoe, the only way to cross from their guesthouse and our guesthouse was to climb along the edge of one the buildings and then cross on a “balance beam” of loosely lashed, wiggly bamboo. It was a bit of an adventure going back and forth. The next day Jette and the Kiwi kids played all morning. What a treat. 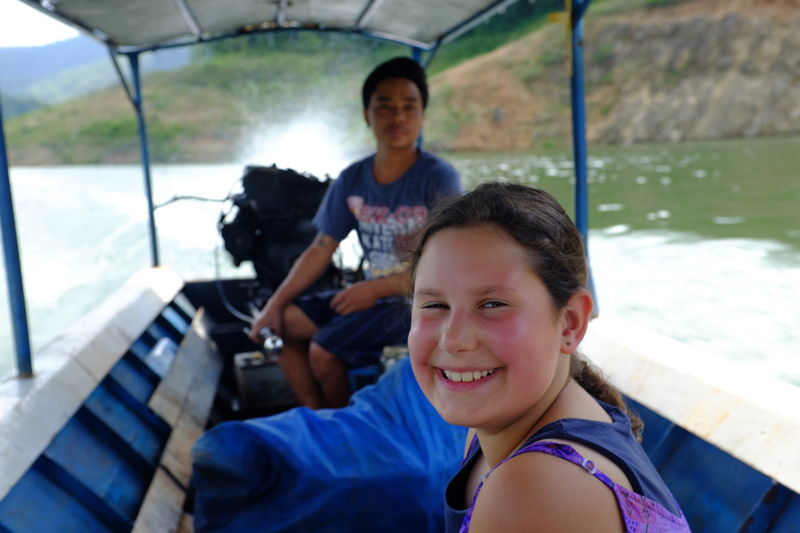 Just before lunch we jumped back in a longtail boat and headed back towards civilization. We had a great time at the lake. It was nice to get off the beaten path and just relax for a couple of days. It was especially nice for Jette who got to swim, conquer the high-dive, and make some new friends! Best Thai Cooking Class Ever! 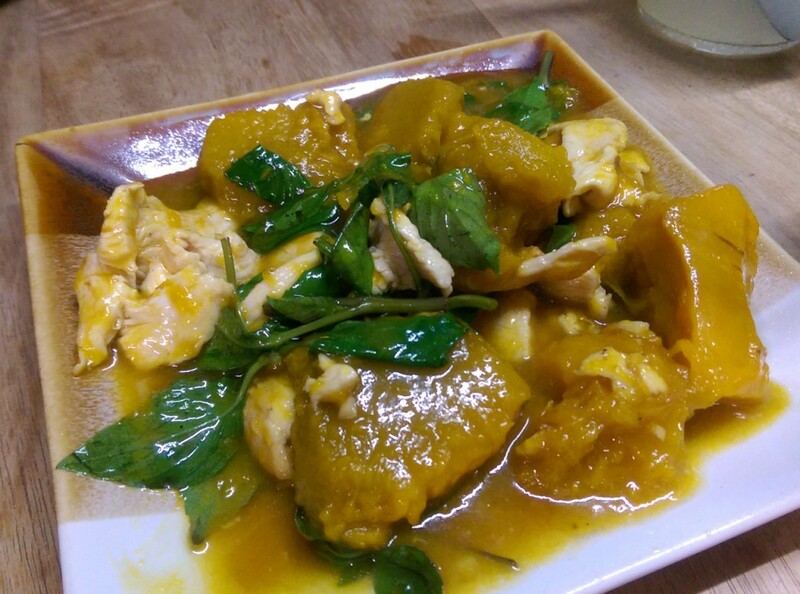 We can cook Thai food! I wish I could send it through the blog. It’s yummy! 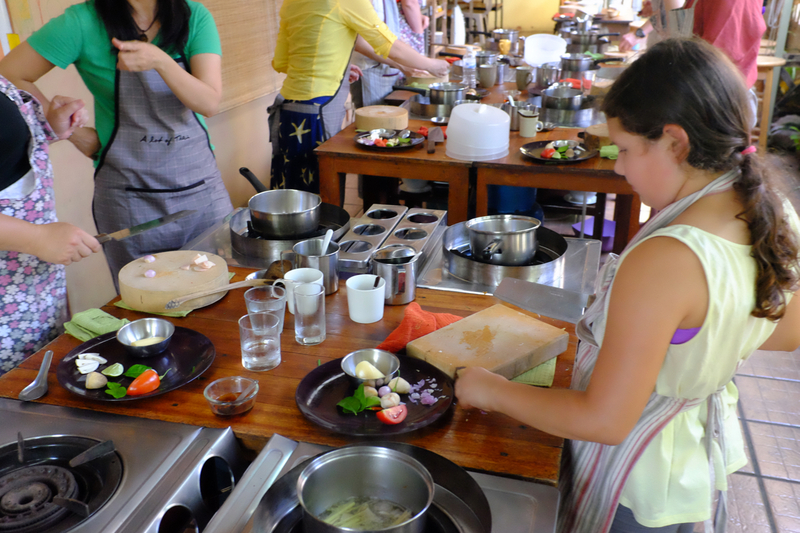 Last week we took a really great Thai cooking class at A Lot of Thai here in Chiang Mai. Our instructor Yui was fantastic. 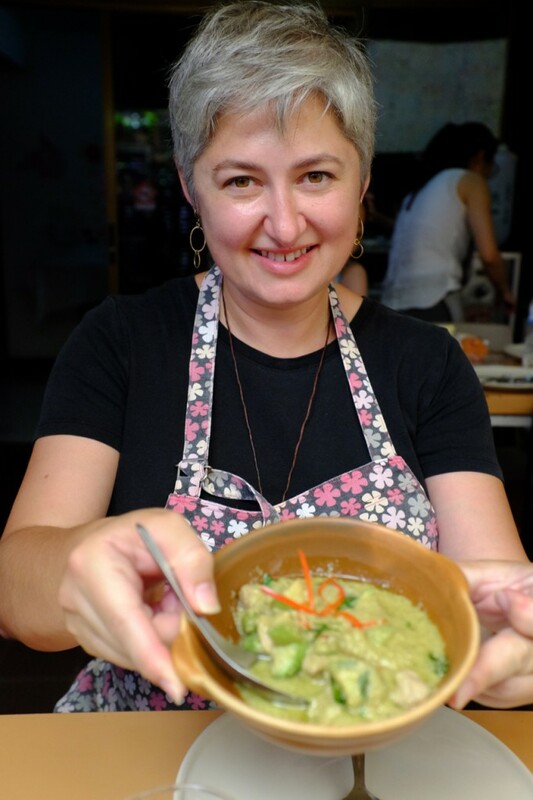 She has a wealth of knowledge and experience and a real gift for sharing it. Her humble style is endearing and her smile and enthusiasm are infectious. Not only did we learn a lot, we had a lot of fun! OK. 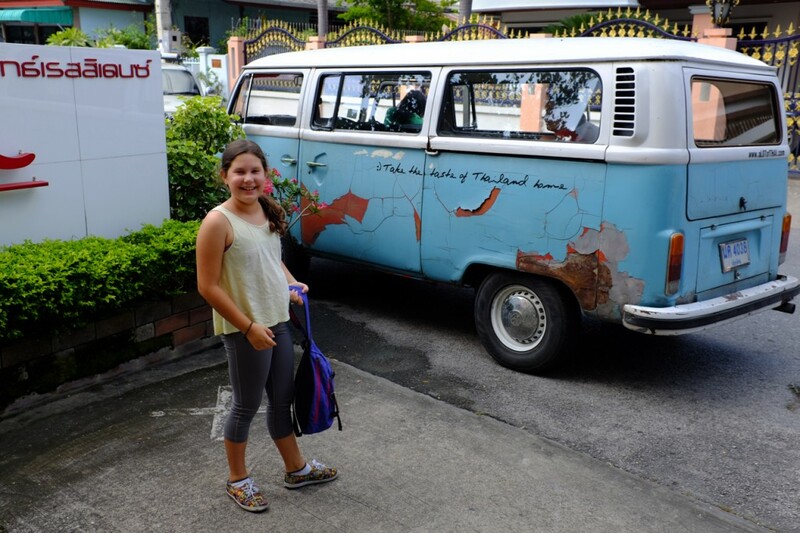 So, the day started when a groovy 1974 VW van came to pick us up at our hotel. In the blink of an eye we were at Yui’s family home with our fellow students – a Dutch couple and four ladies from Taiwan. 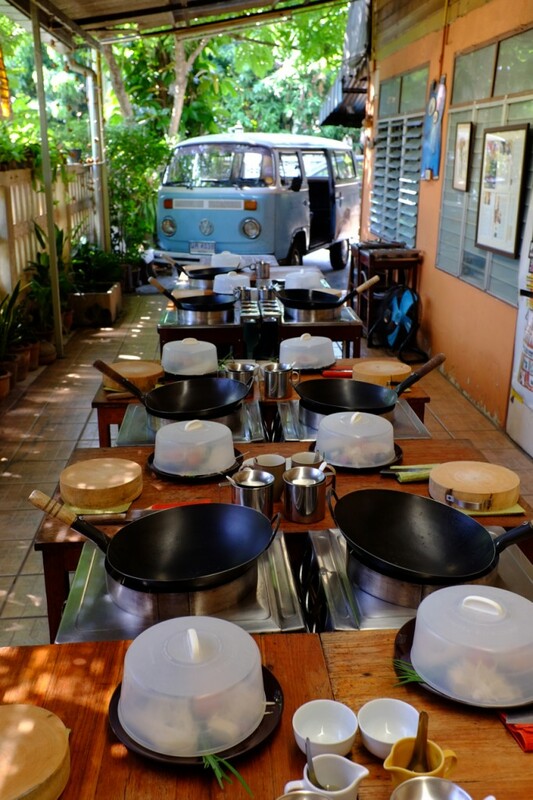 In Thailand it is very common for homes to have outdoor kitchens and a large covered patio at Yui’s house was exactly that. 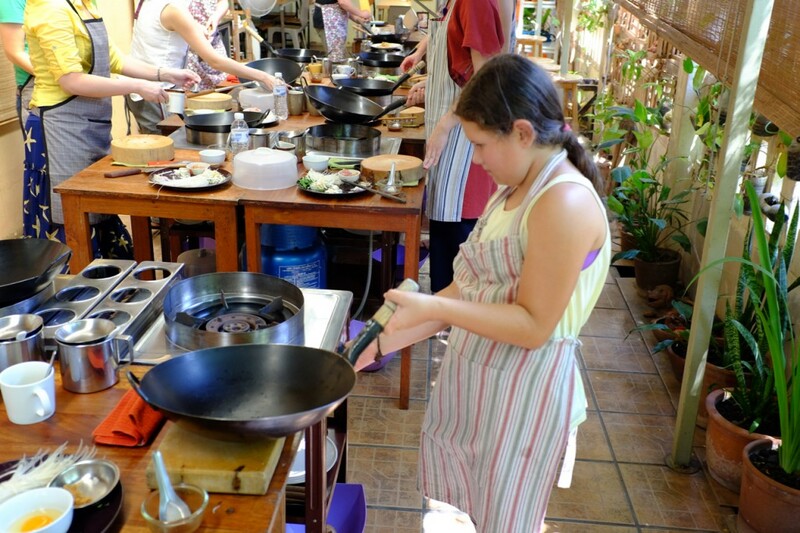 There was a cooking station set up for each student, a demo area for Yui, and a dining area where we could enjoy the fruits of our labors. 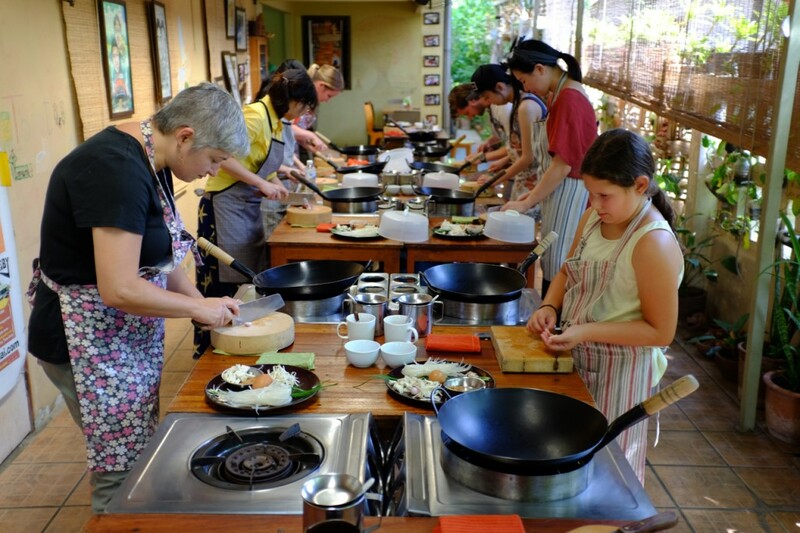 We donned our aprons and jumped right into learning how to cook Pad Thai. 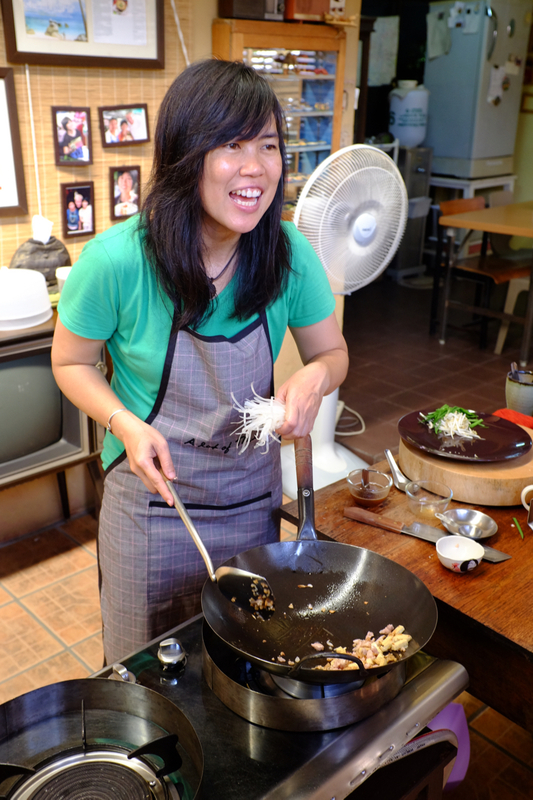 Yui talked about the dish, the underlying philosophy of flavors in it and in Thai cooking in general. 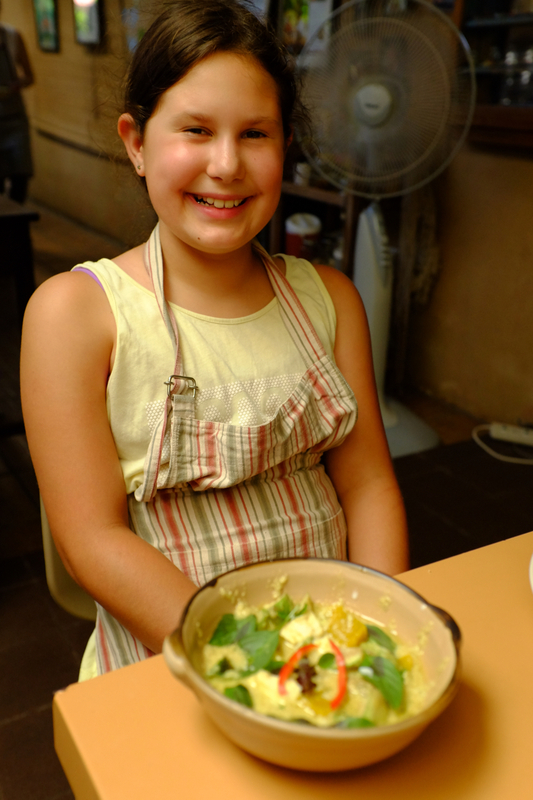 Then she showed us how to make the sauce. More than just the measures of the ingredients, she taught us the reasoning behind the combinations of flavors, how to adjust the proportions for variations in component flavors and which components of the sauce to adjust based on the vegetables in the dish and which to adjust based off the meats. 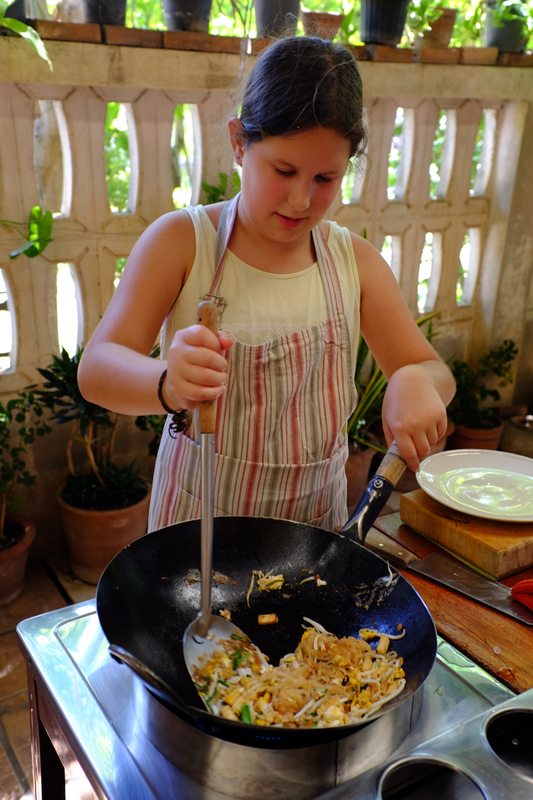 Before any cooking we were tasting her sauce and evaluating the flavor profile and identifying the components. 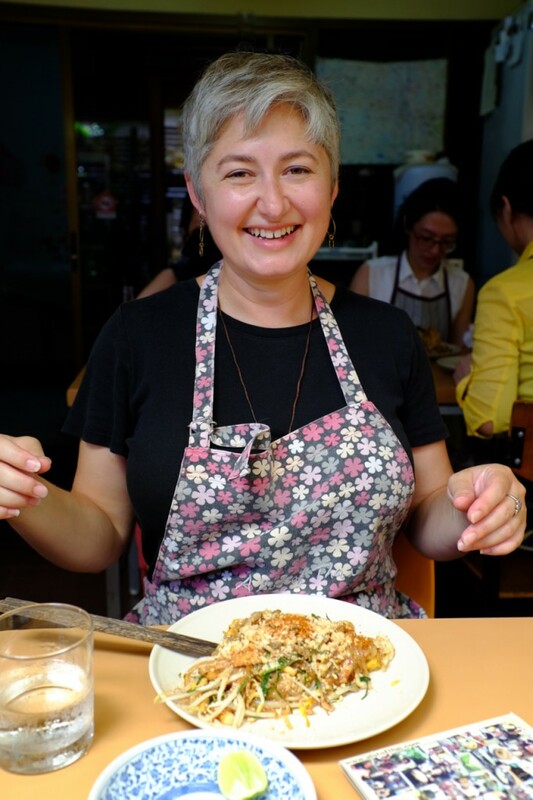 By the end of her demo we had learned how to build a sauce based on taste, this philosophy of proportions, and understanding which ingredients countered others for balance. This was a big “a-ha” for me. On the rare occasions that I’ve tried to cook Asian stir-fried dishes in the past I’ve never built the sauce first and never by taste. I’ve combined sauce components based on a recipe or a guess and then tried to adjust once the cooking starts – when it is already too late! 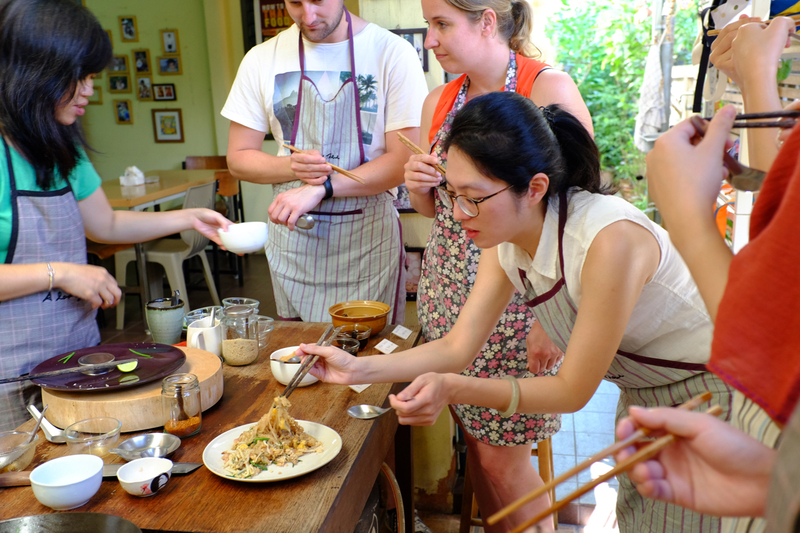 After our sauce and ingredients were prepped, Yui cooked her dish and we all had a chance to taste the finished product. 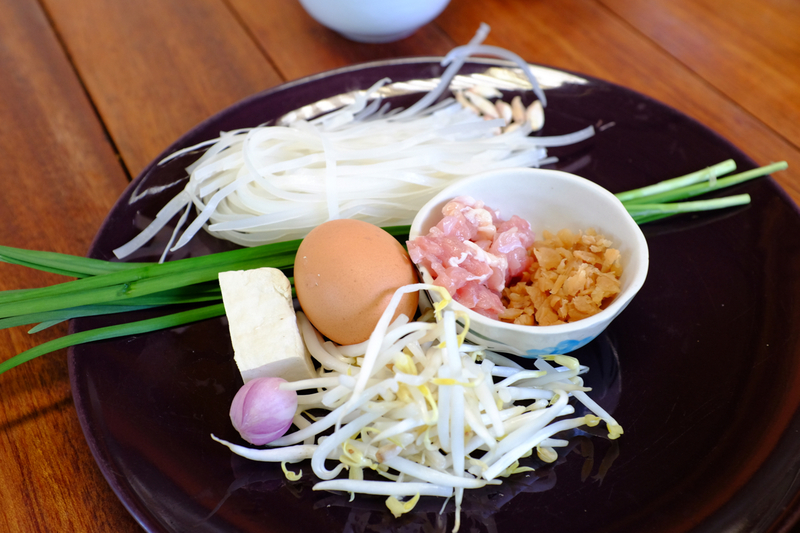 This was key, as not only did it give us a point of comparison for our own dishes, it allowed us to train our palates to make the “taste translation” from the raw sauce to that of the finished dish. It tastes best when you cook it yourself! 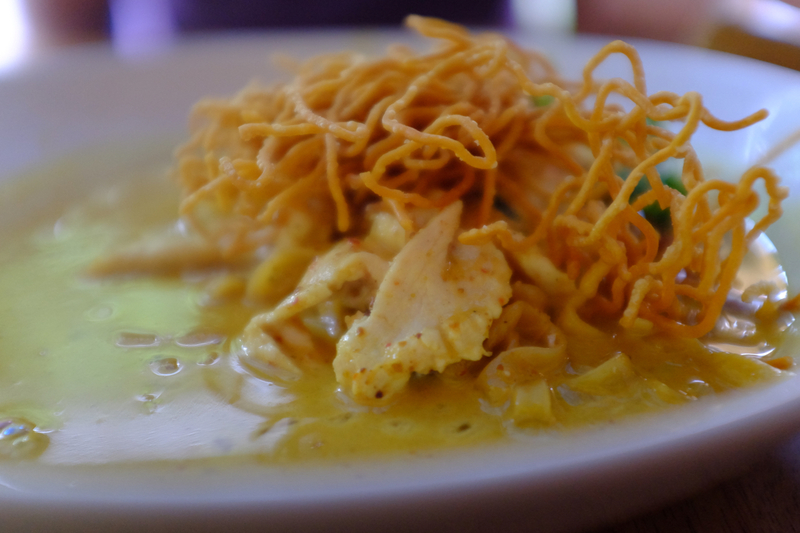 After Pad Thai, we learned red and green curry, hot and sour prawn soup, and stir-fried chicken with cashew nuts. 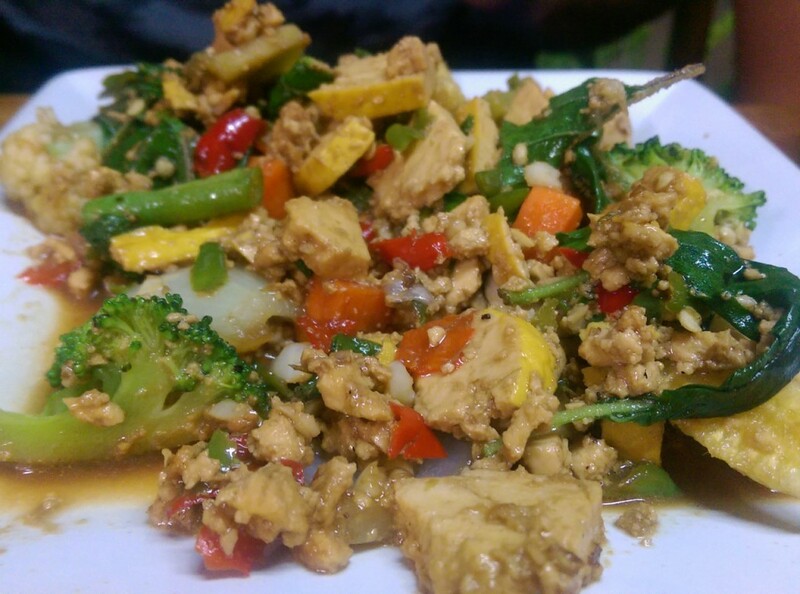 Another “ah-ha” moment for me was how to get the correct cooking temperature, with the stir-fries in particular. 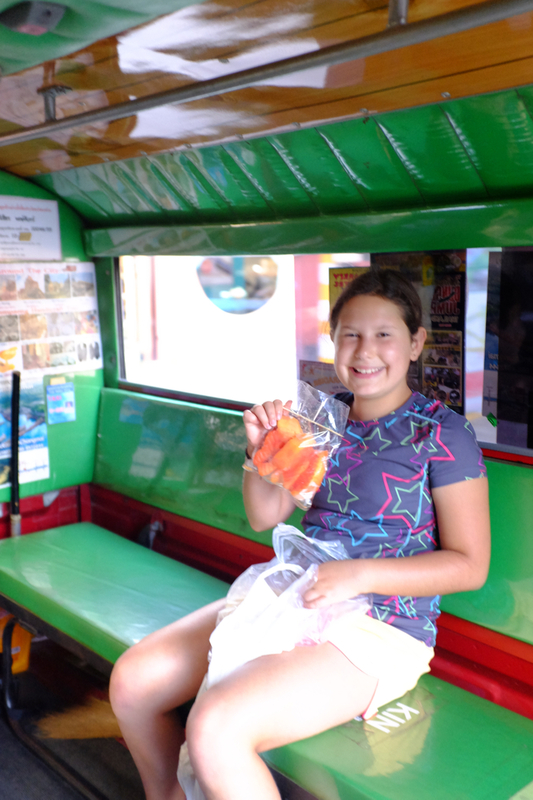 We took a break from cooking, piled into the VW bus and headed to the local farmer’s market to learn all about Thai produce and ingredients. 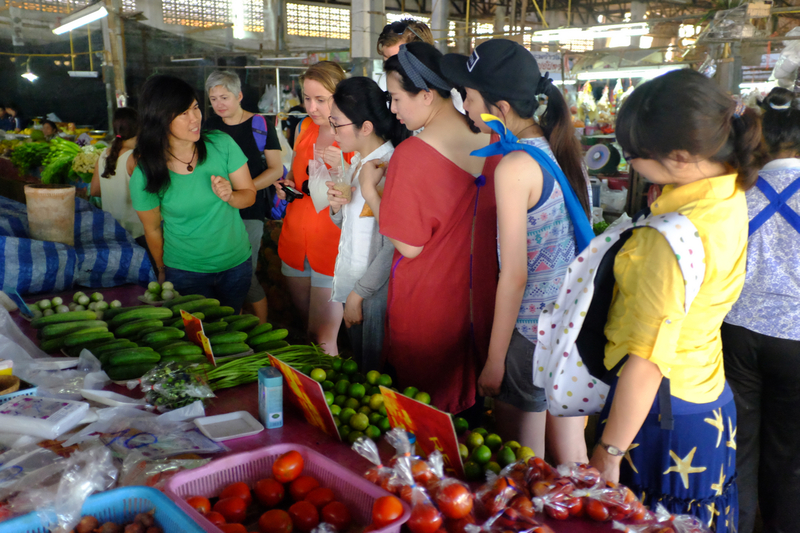 This was a great experience as we were able to learn what to look for and how to select the best produce. 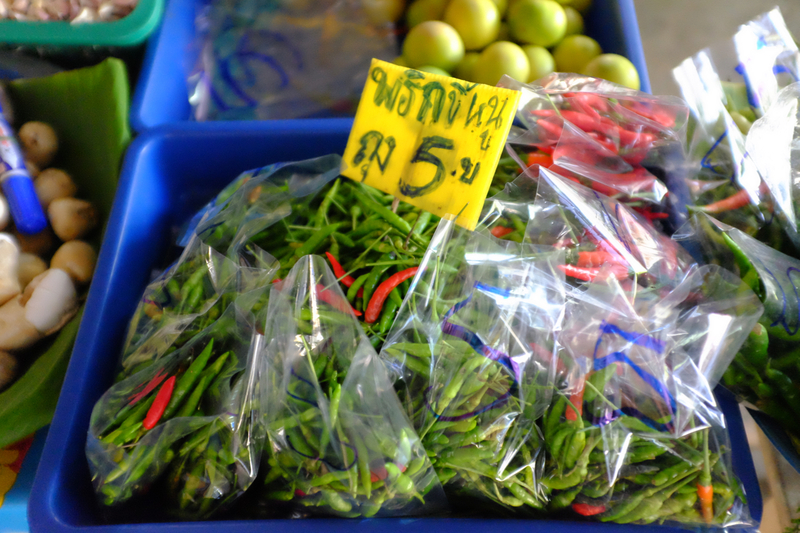 For example, the Thai Eggplant I’ve bought at the Asian markets in Dallas has been much seedier than the Thai Eggplant we used in class. 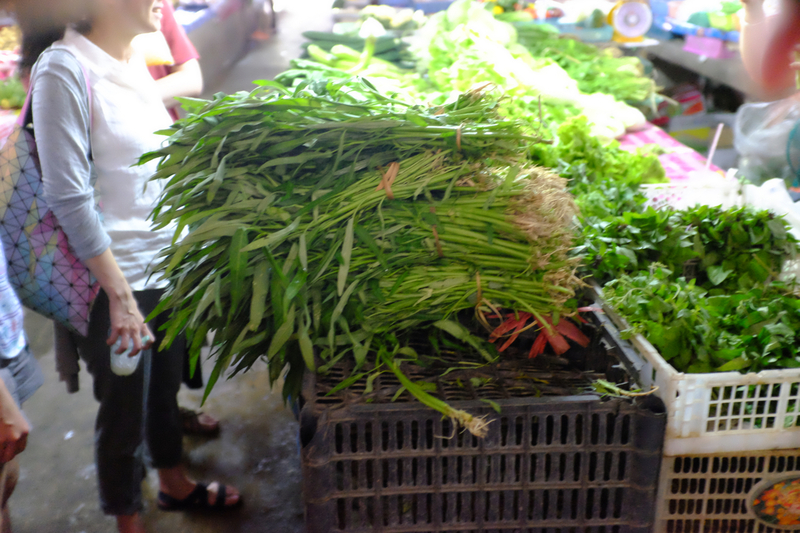 I asked Yui about this and she showed us what to look for when buying it at the market. Sorry, it’s a secret! 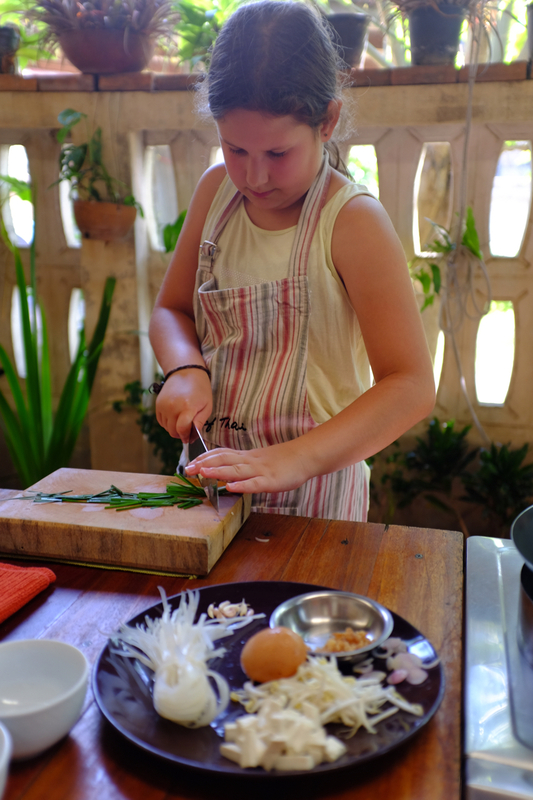 To learn it, you’ll have to come to Chiang Mai and take her class. After the market it was back to Yui’s house for an afternoon of cooking. 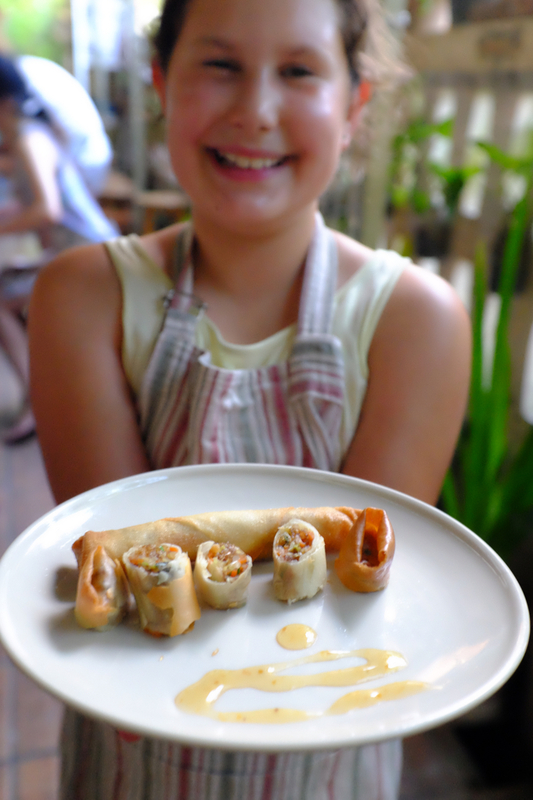 We learned how to make perfect, crispy spring rolls that are NOT at all greasy. 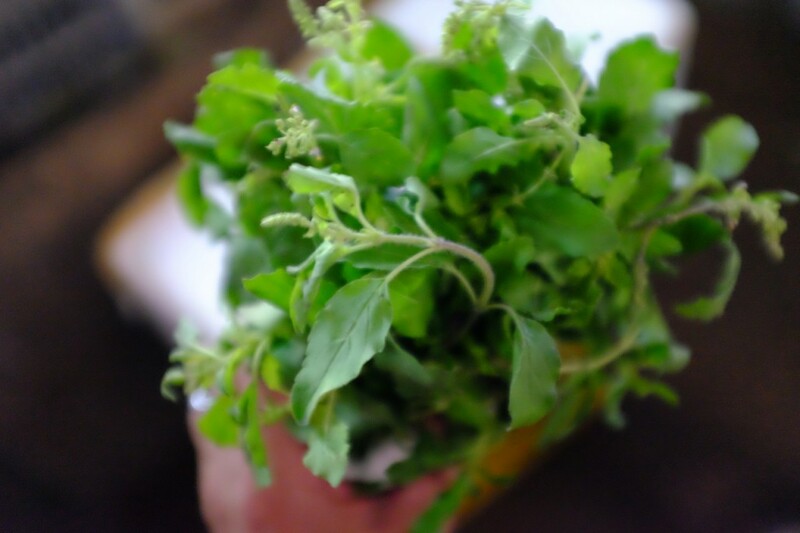 The secret is in the temperature of the oil, the rolling technique, and a secret ingredient. 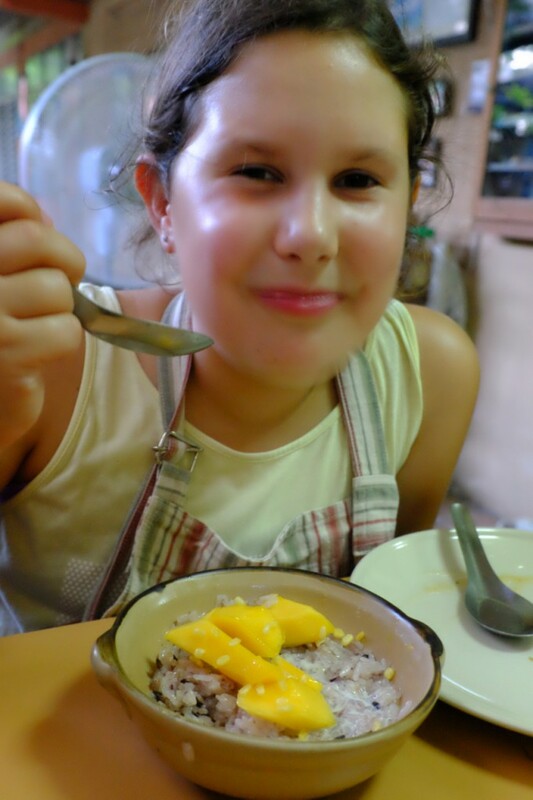 The last dish of the day was the one that I was the least interested in: mango sticky rice. It turned out to be one of the highlights. When done well, it is subtle and super-delicious! 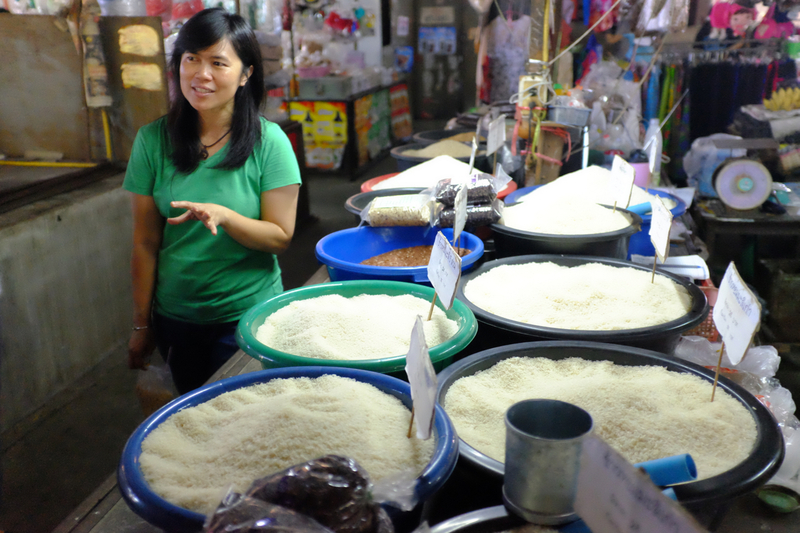 We leaned how to do it well and about rice varieties and cooking methods in the process. All-in-all it was a fun, fantastic day. 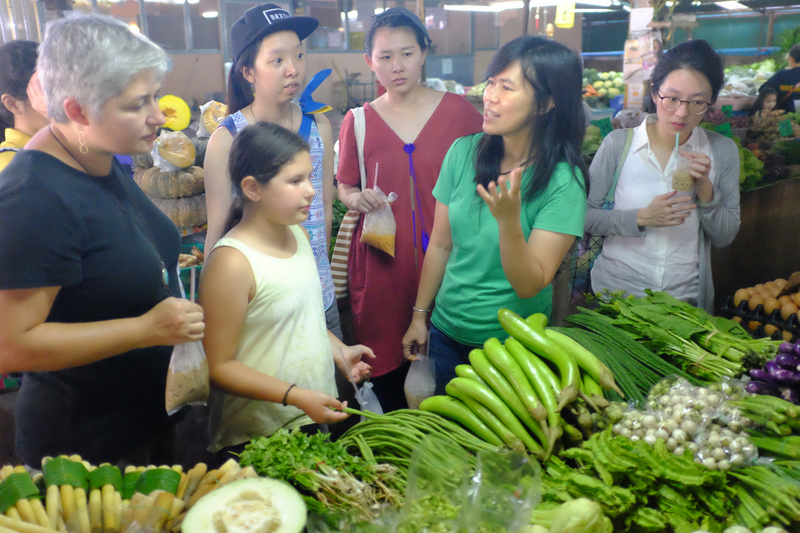 We all learned a lot at A Lot of Thai. Thanks Yui! 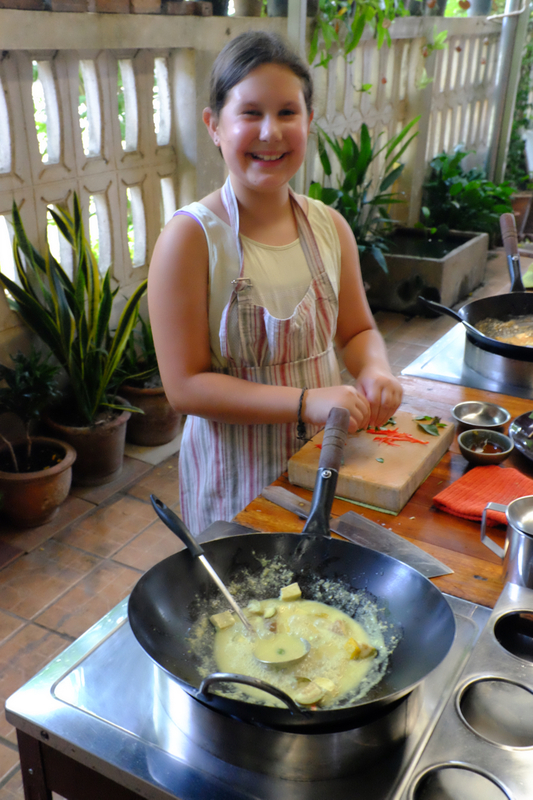 As you might expect Jette loved it and is on her way to becoming a super-cook. 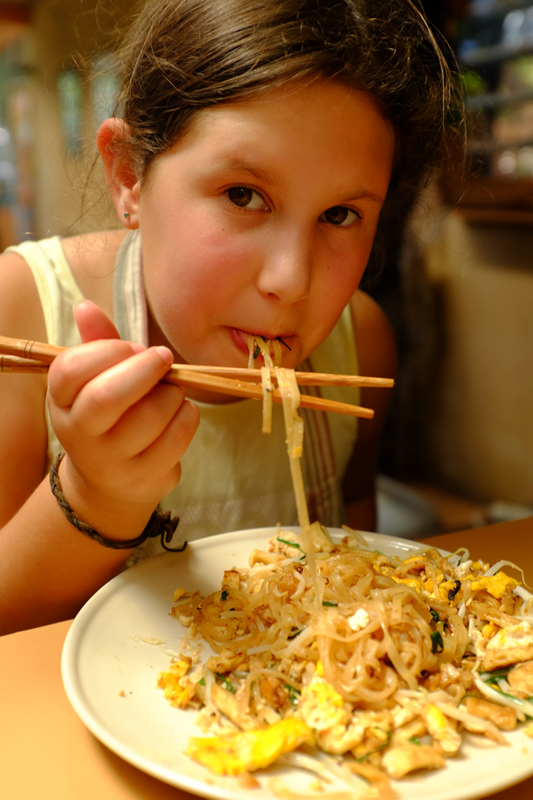 I can’t wait to get home and have her cook me some yummy Thai food. Maybe you’ll get lucky too! 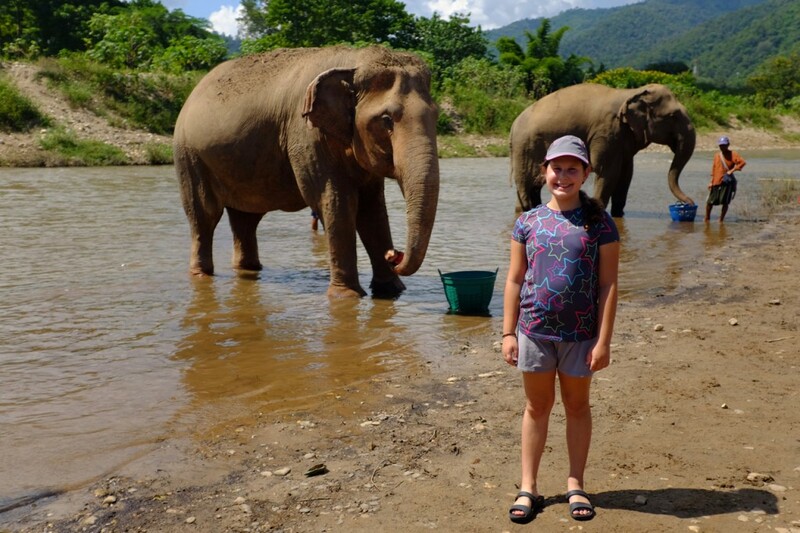 Any visitor to Chiang Mai will be utterly bombarded with offers for jungle treks, zip line adventures, visits to hill tribe villages, and elephant rides. This place is tourist central and there a dozens if not hundreds of folks offering all of these things and more. 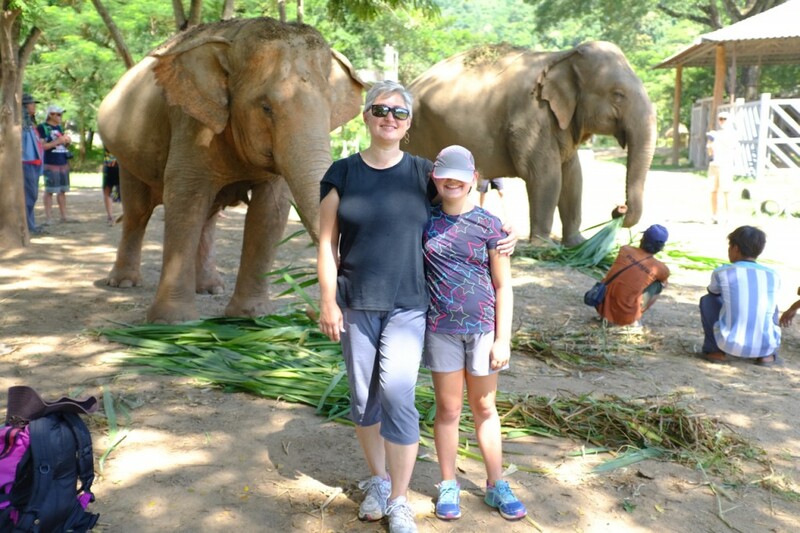 We’re not particularly interested in these tourist experiences, but we did want to see some elephants. 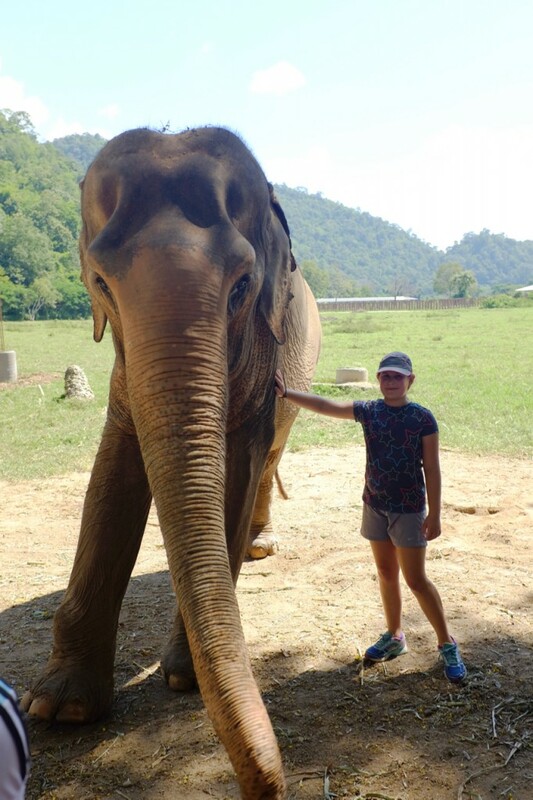 We took a day trip out to Elephant Nature Park, an elephant (and dog) rescue operation that seemed to be the most ethical way to see and support our big cousins. 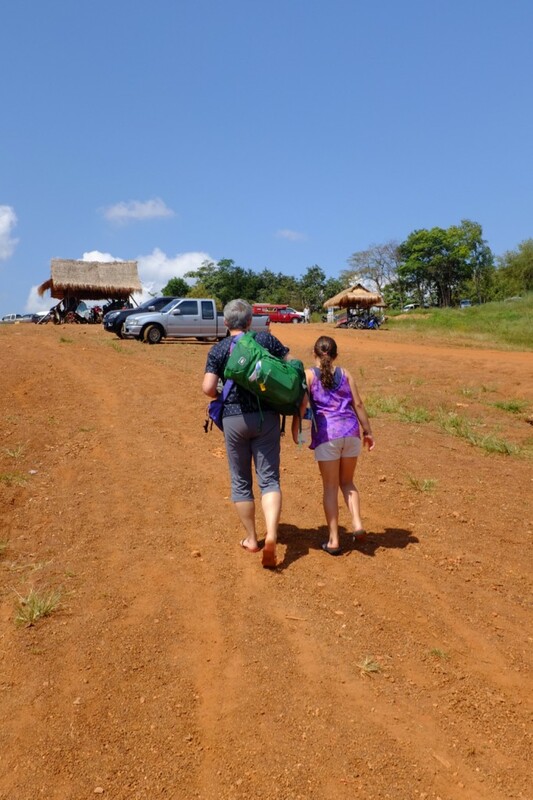 It is quite a tourist operation, but hopefully our money and time went to a good cause. 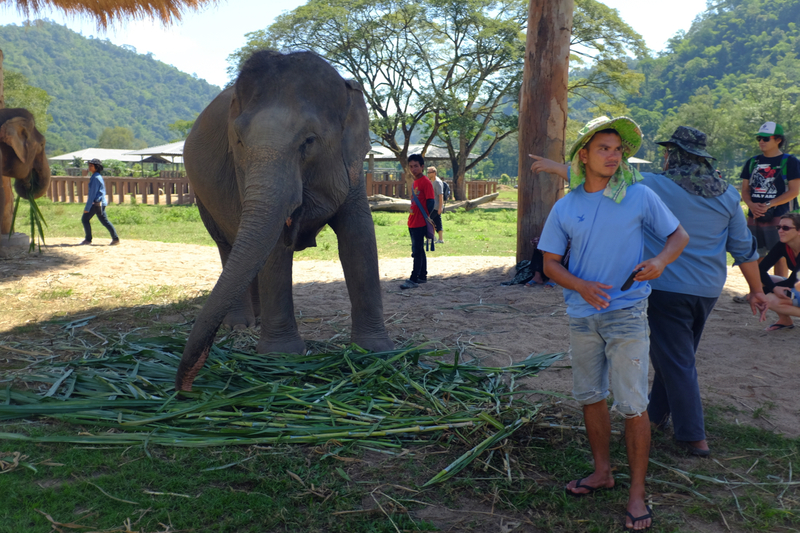 As you might expect, the story of the elephant in Northern Thailand, and SE Asia in general, is a sad one. Humans have encroached on their natural habitat and there are very few elephants left in the wild. For many decades elephants have been captured or bred in captivity and used as beasts of burden, especially in the logging industry. 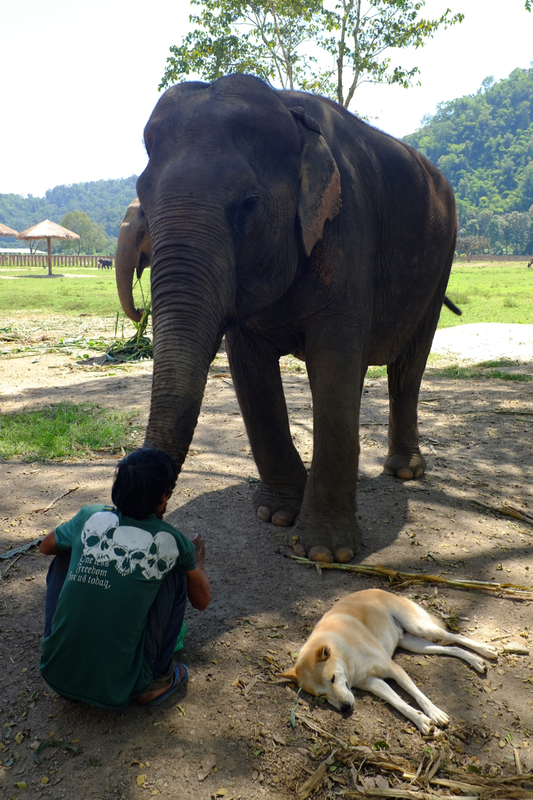 In the 1980’s the Thai government cracked down on logging and most of the elephants who were previously used for logging were “out of work.” Wild elephants are now a protected species. 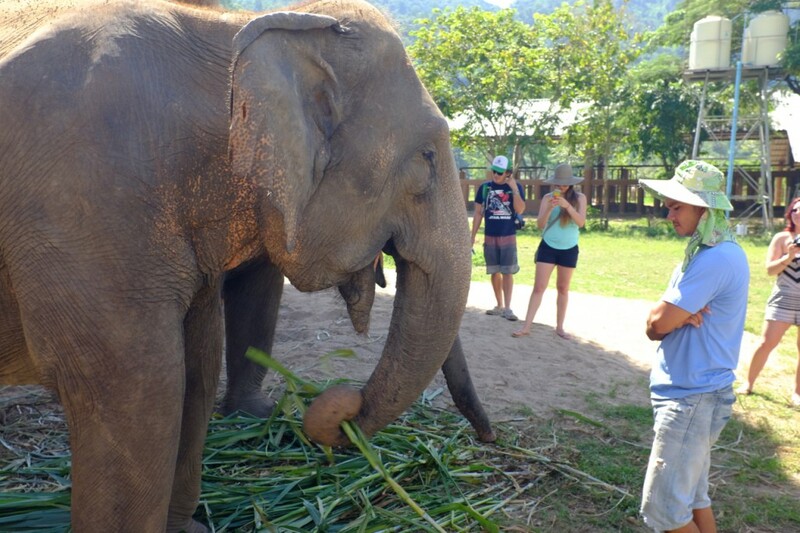 But “tame” elephants exist in a sort of legal grey area and are often considered unprotected livestock. 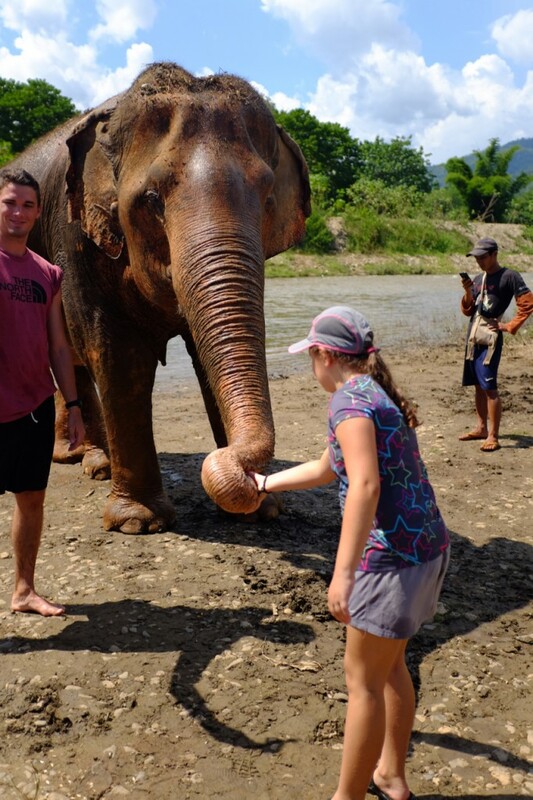 Thus many elephants have been put to work carrying tourists around, performing on the street, and generally being used for entertainment. 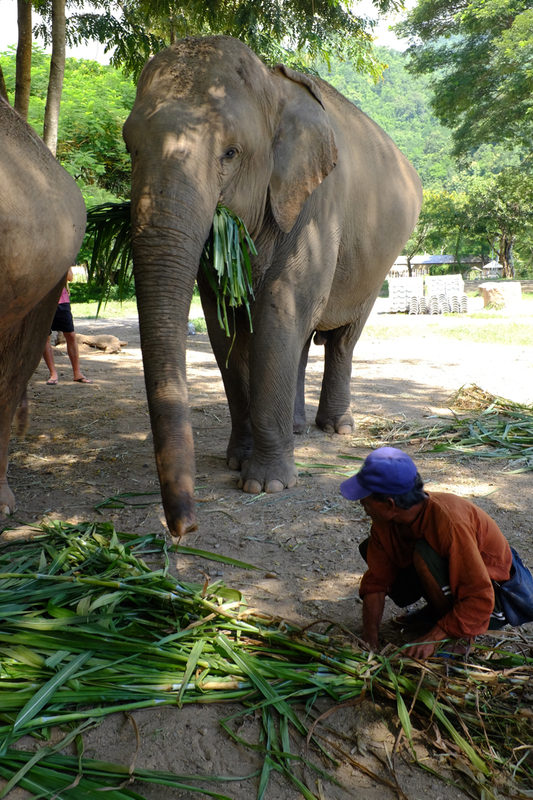 In other parts of SE Asia, they are still used in logging, and in the areas along the Thai-Burmese (Myanmar) border many elephants are still casualties of land mines. 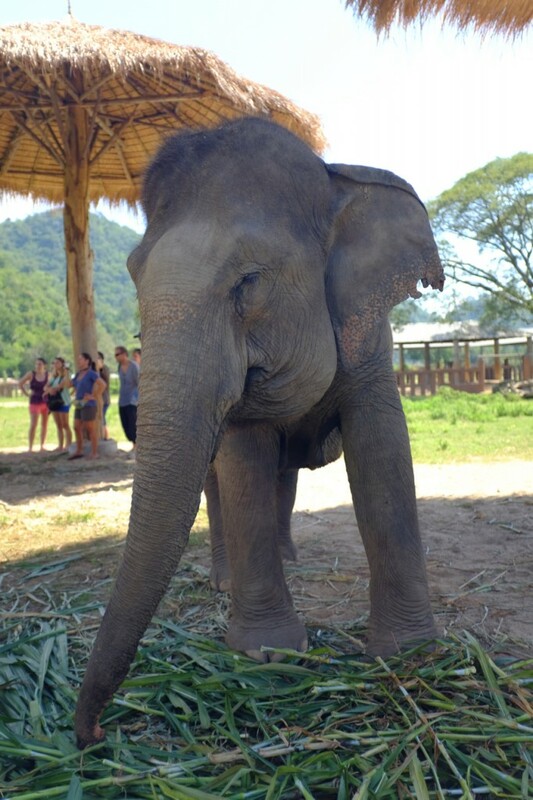 Two or three of the elephants we saw at Elephant Nature Park were rescued after stepping on land mines and had feet and legs deformed with injuries from the blasts. 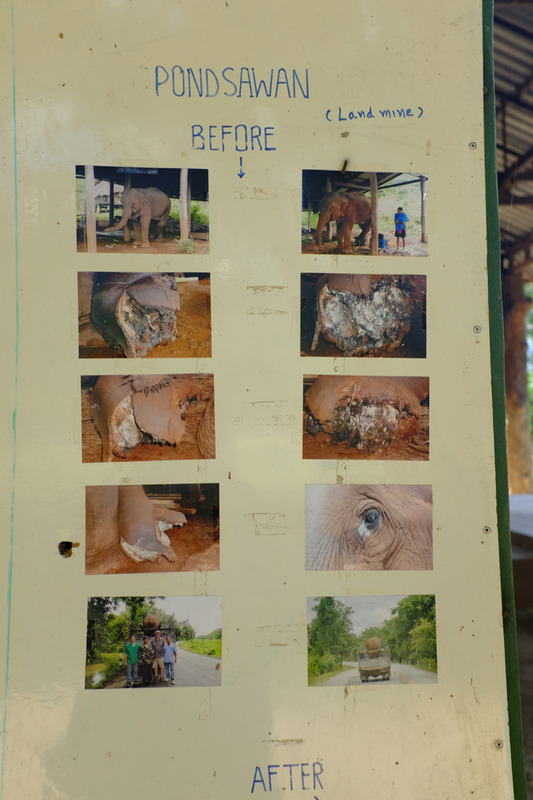 A poster showing photos of one of the elephant’s injuries from a land mine. You can see more about Elephant Nature Park and it’s rescue mission here on National Geographic. 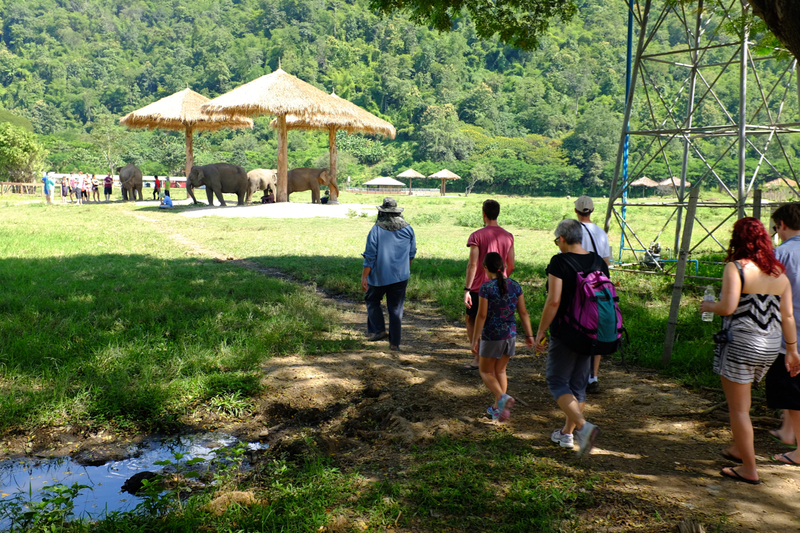 The Elephant Nature Park facility is tucked into a very pretty valley with a river running through it. 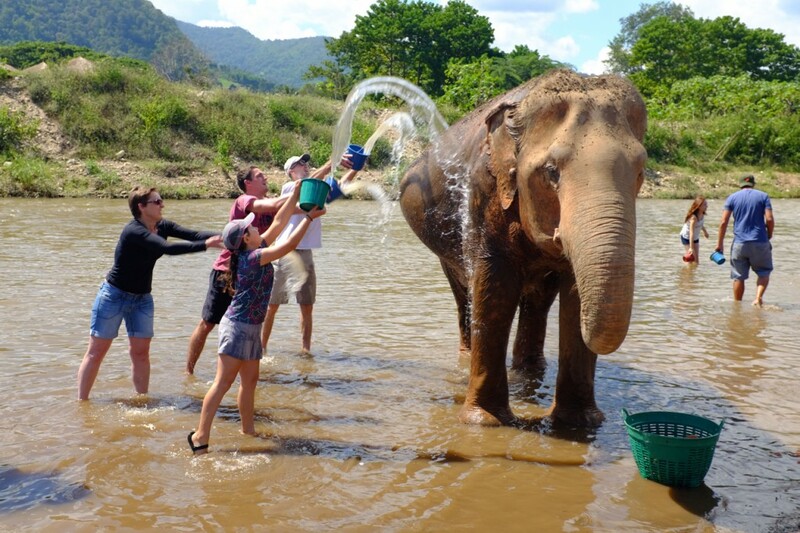 The river is essential, as the elephants like to bathe regularly. They wash themselves (or we wash them!) and then cover themselves with dirt. The dirt is a natural sunscreen and also acts as a barrier against insects. In Africa, I’ve seen birds which sit on elephants and groom them, eating insects and enjoying a symbiotic relationship with the big guys. 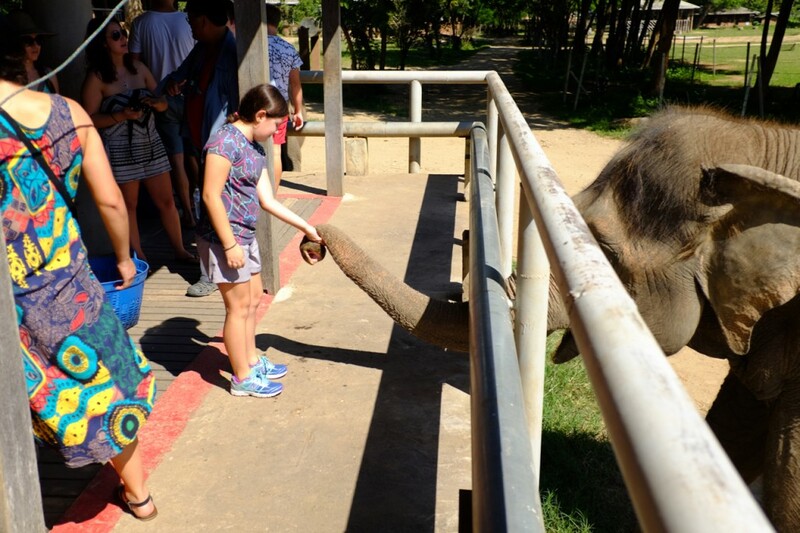 I didn’t see that here and the staff at the sanctuary said that there were no such birds in Thailand. 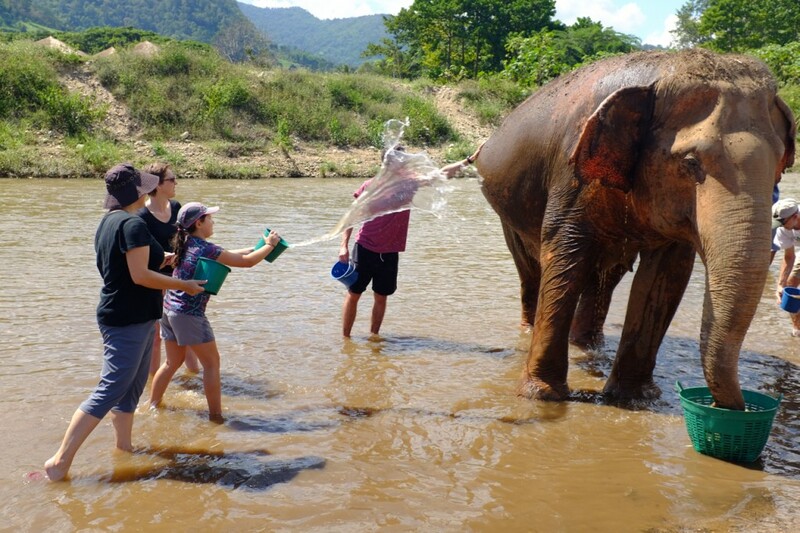 One of our activities as visitors was to walk down to the river and toss buckets of water on the elephants, “helping” them bathe. I don’t think they needed the help, but it was lots of fun for us! 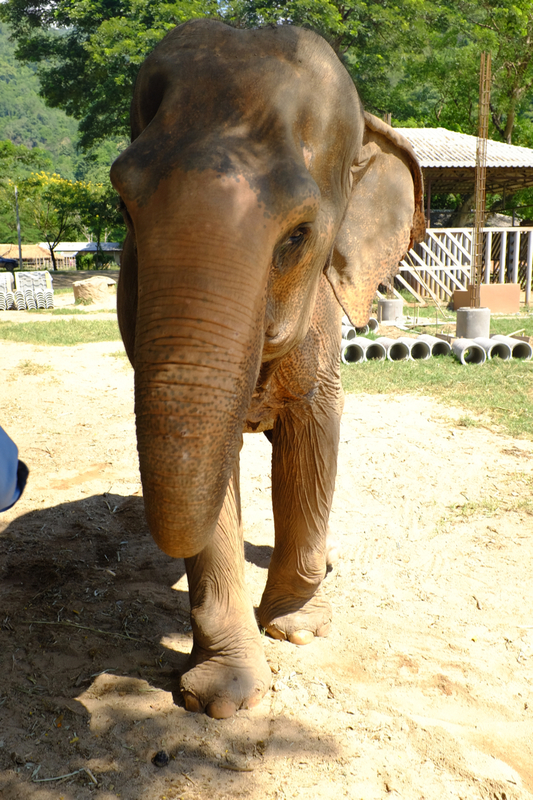 I don’t remember her name, but this elephant was one of the older ones. If I recall correctly, she was in her 70’s. See the big tummy? She’s not pregnant, just fat! We’re all enjoying the cool water. 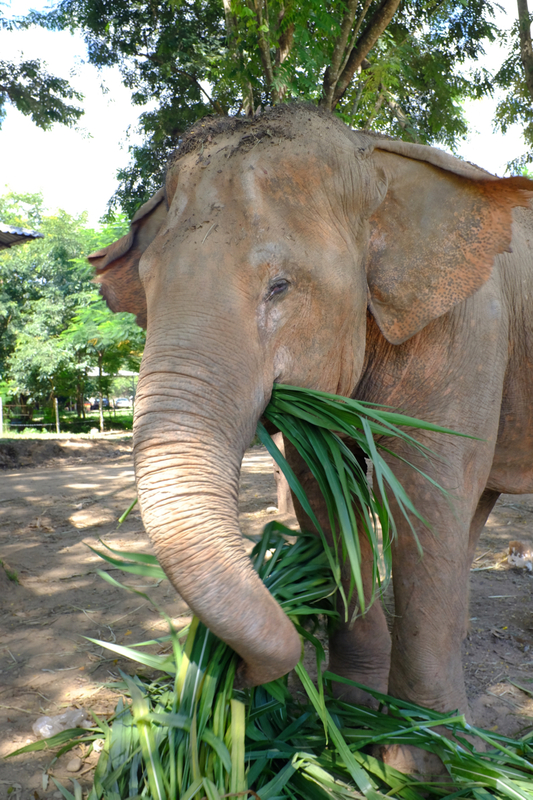 POP QUIZ: How much do Asian elephants eat in a day? 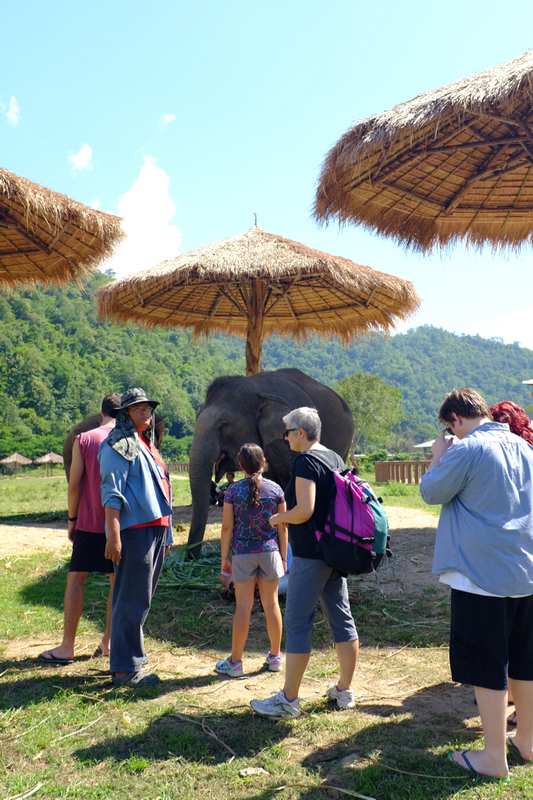 After the meet-and-greet, we walked around the property and met the elephants. 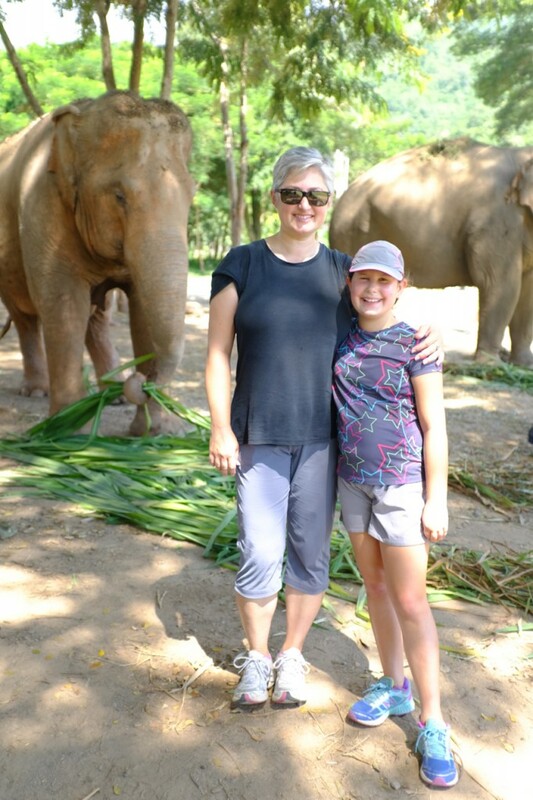 All of the elephants we interacted with are female. The males are more aggressive and are kept in another area. 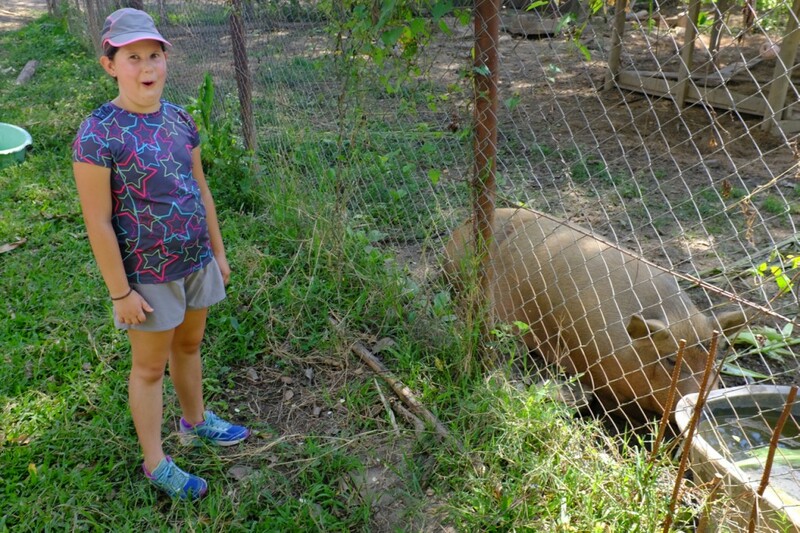 We met a pig along the way. Oh, look at the piggy! She(?) was actually quite aggressive. I poked a piece of green grass through the fence and she nearly got my finger in a surprise attack! 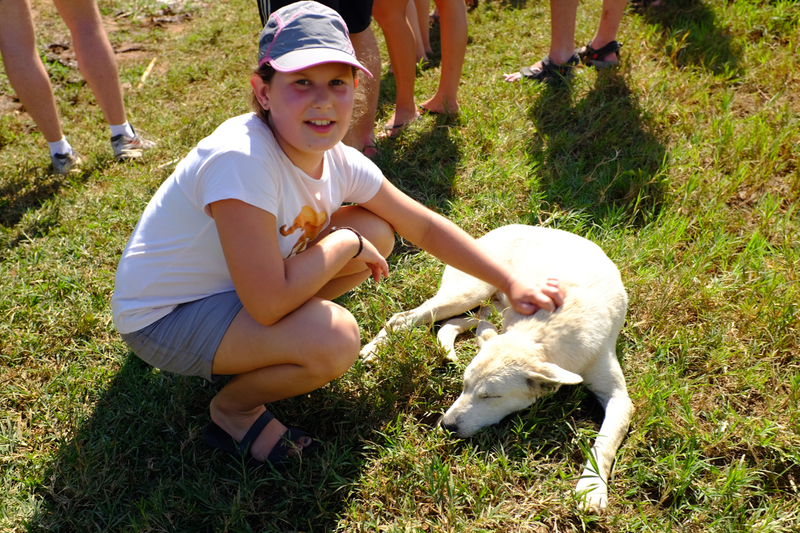 There were also hundreds of rescued dogs. Though we didn’t get to see many of them, some of the less aggressive ones were lounging about, and even “working” with the elephants handlers. As you may know, Jette loves dogs. It was a great day. 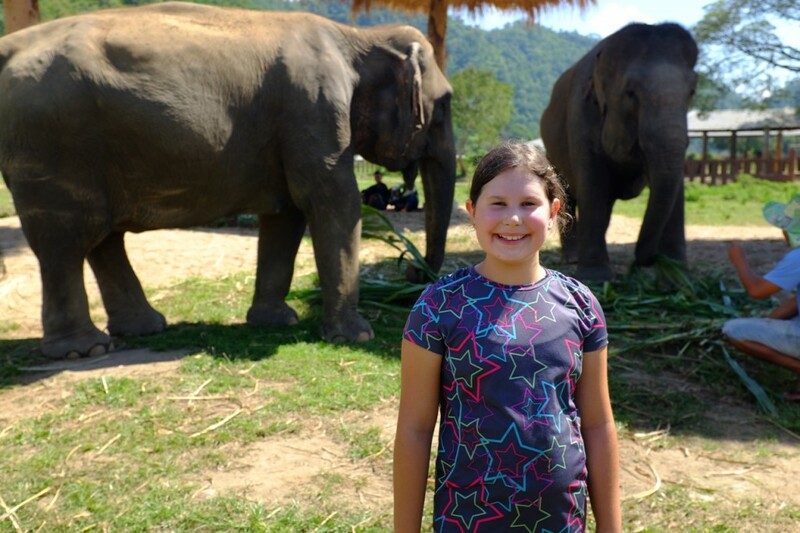 We learned a lot about Asian elephants, the plight of elephants in Thailand, and got to see what one rescue operation is doing to try to make a difference. Wow. 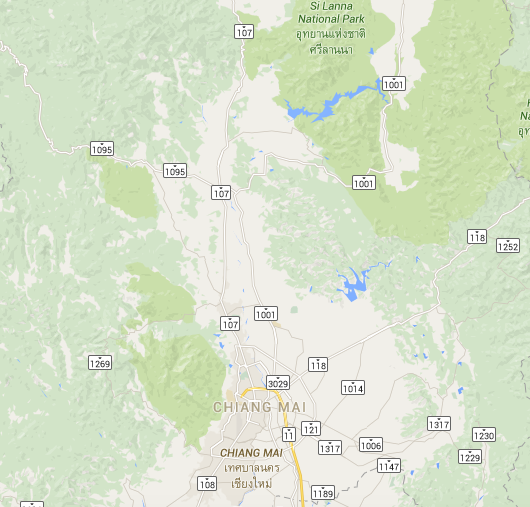 How time flies… Let’s see if I can fill you in on our time here in Chiang Mai (red pin on the map below). 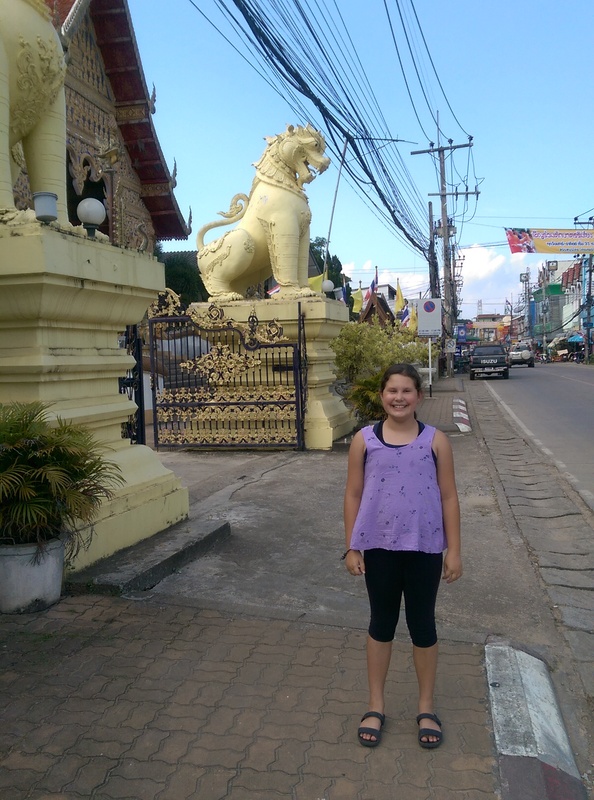 Chiang Mai is the second largest city in Thailand, but it feels small. 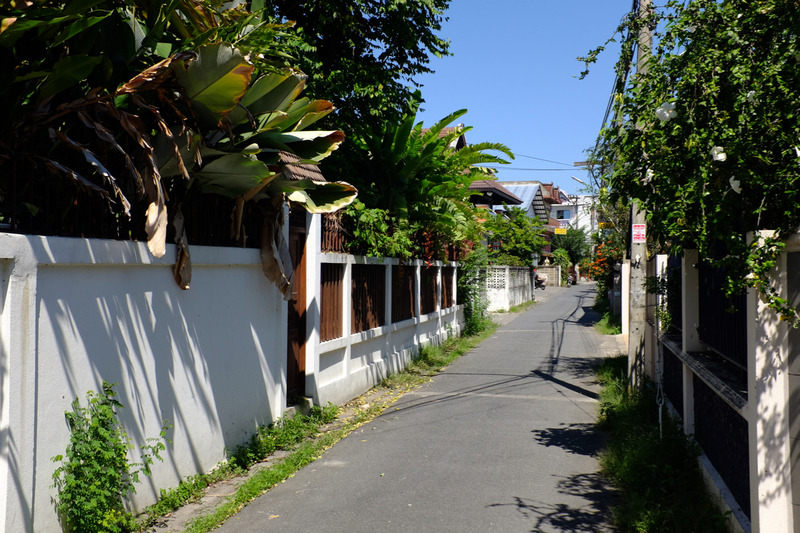 There are few high-rises and it lacks the urban edge of cities like Bangkok. 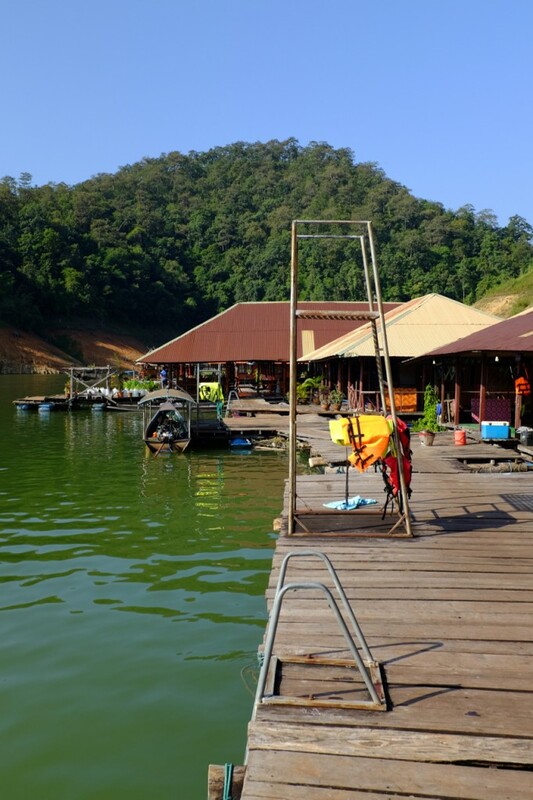 On the edge of the mountains of Northern Thailand, it is a very, very popular tourist destination and there are lots of western ex-pats living here. 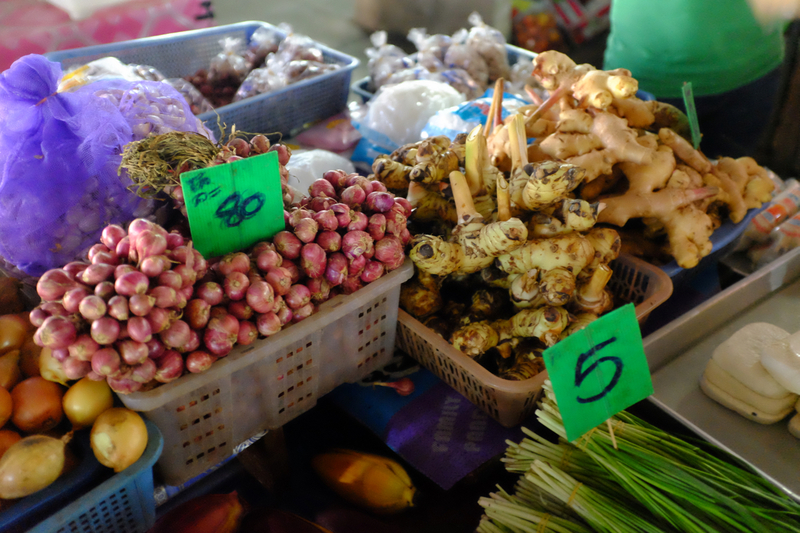 Hundreds of years ago, Chaing Mai was the capital of the Kingdom of Lan Na and it is still at the heart of Norther Thai culture. 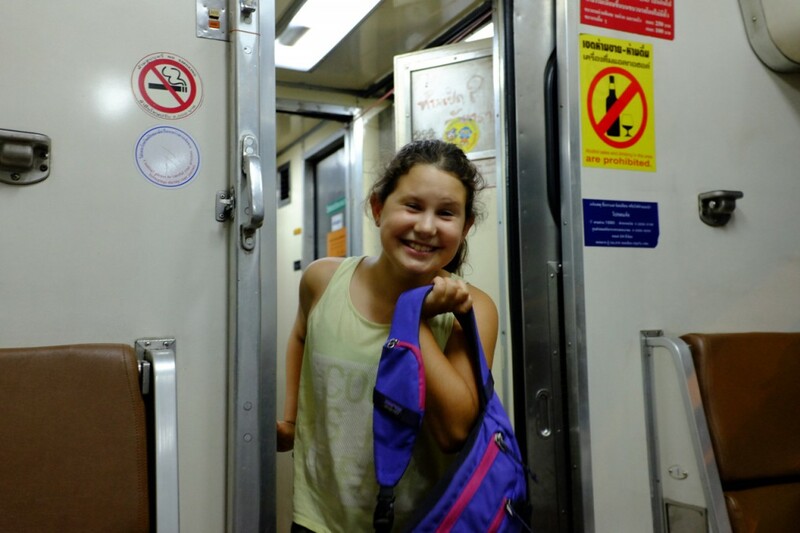 As you’ll recall, we took the night train from Bangkok. 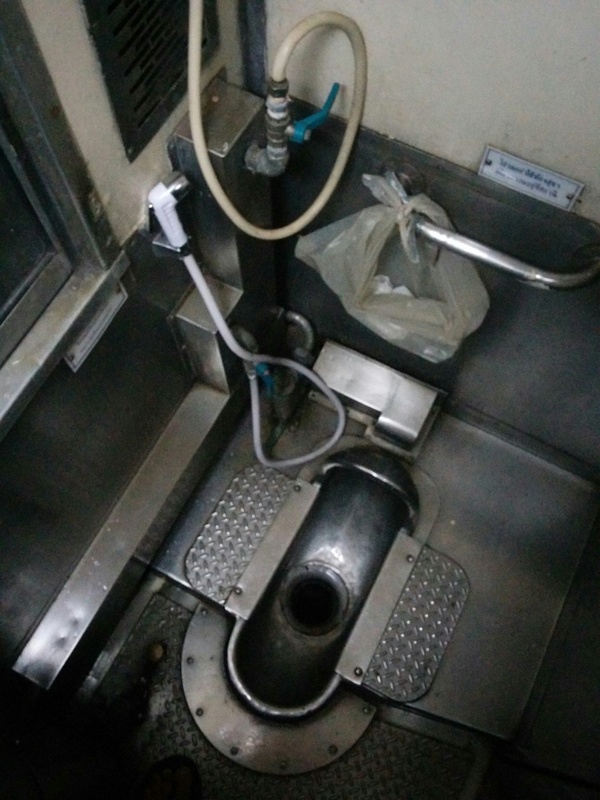 We booked “air-conditioned 2nd Class” tickets which gave us sleeping berths. There is a first-class option, a 2nd class non-AC option with sleeping berths, as well as regular non-berth seats. 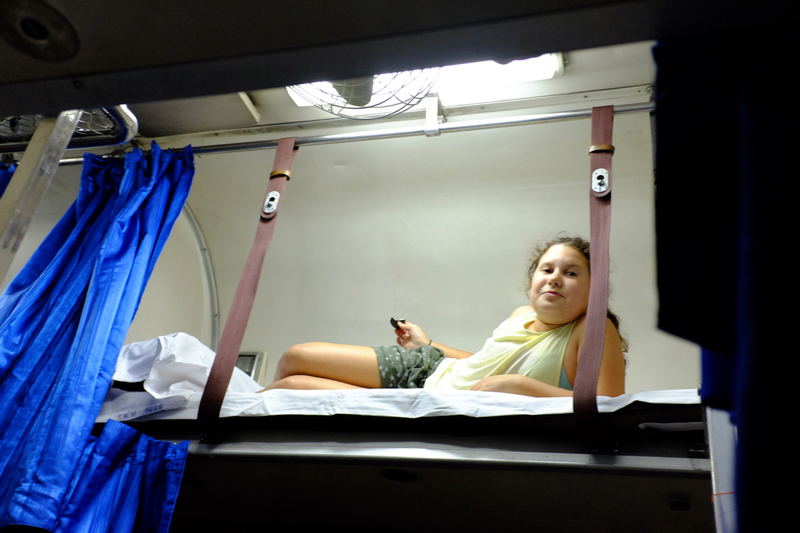 We wanted sleeping berths and figured the AC car would be quieter and more comfortable, which I think it probably was. Excited to be on another night train. Squatty potty with a view of the track through the hole. It’s not a smooth ride, so the grab bar could be very useful. Careful with that spray hose when you wash your bottom. Toilets aside, it was a fun and fairly comfortable ride. We started with seats and after about an hour or so, the attendant came through our car, converted the seats to beds and put on nice clean linens. There were curtains to close-off each berth. 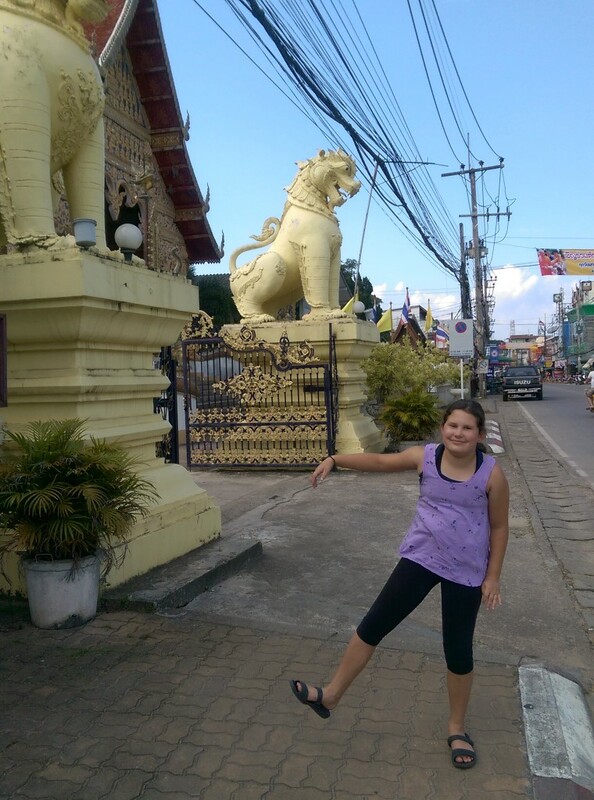 We rolled into Chaing Mai mid-morning, a couple of hours late. Mila had booked a guesthouse online and when we got of the train there was a guy holding a sign with the guesthouse name on it. He was there to pick us up. A free ride is always a nice thing. We followed him out to the parking lot and climbed into the back of his songtaew. 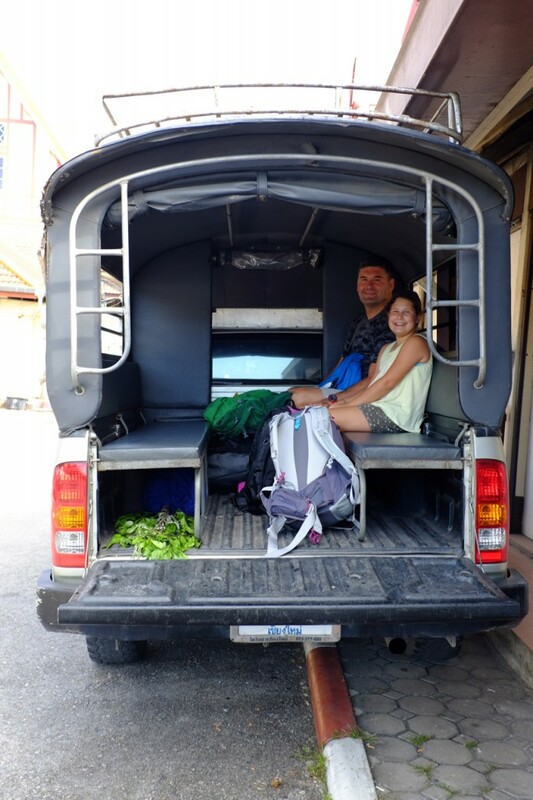 A songtaew is a pick-up tuck with seats in the back and a roof. Fasten your seat belts. Oh wait, there aren’t any! 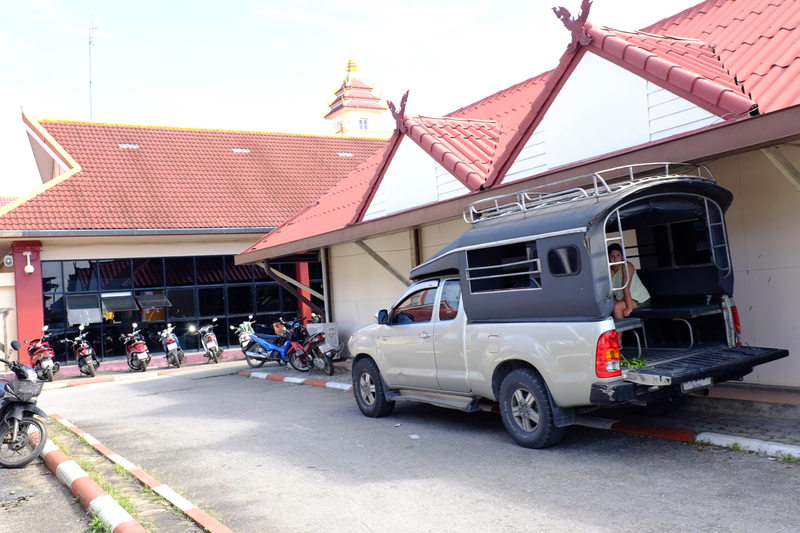 There aren’t many proper taxis in town but there are lots of songtaews and they are one of the most common ways to get around town, and even beyond. The songtaews that operate like taxis are painted red. To catch a ride, you just wave one down and tell him where you want to go. 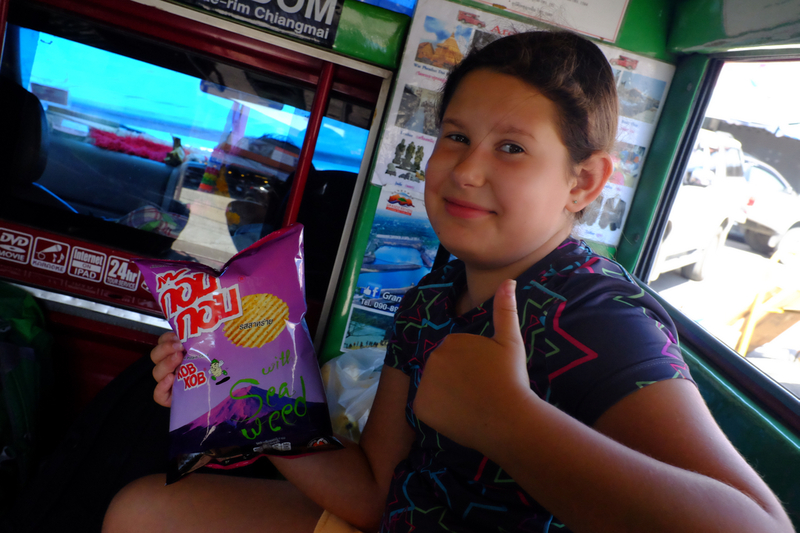 Typical fare is about 20 baht per person (at least that’s the current gringo price, locals probably pay less) for most quick trips around town. 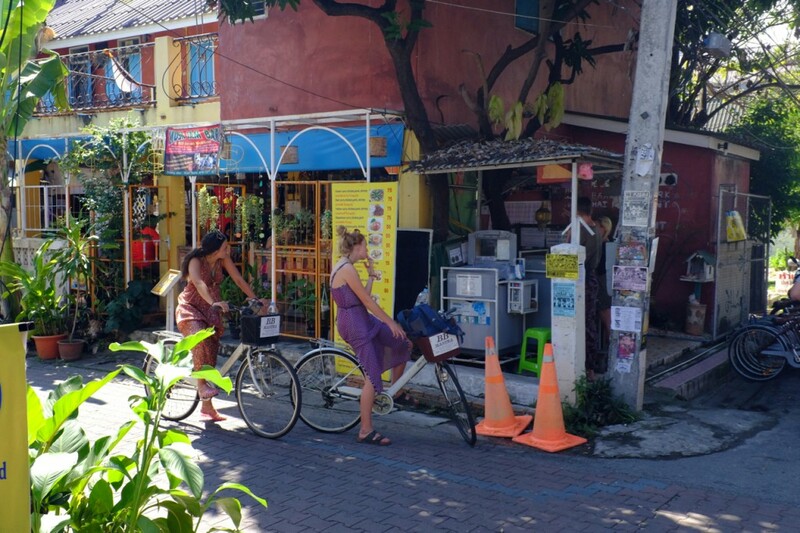 In this case, we just got a free ride to the guesthouse, which was in the northern part of the old city, a neighborhood popular with backpackers. The guesthouse was OK, not great. It had a swimming pool, which was nice, and it was in a good location close to the typical tourist haunts of the old city. It wasn’t the cleanest place, the bathroom in particular (are you sensing a theme here?! ), and they only cleaned the rooms once every three days. 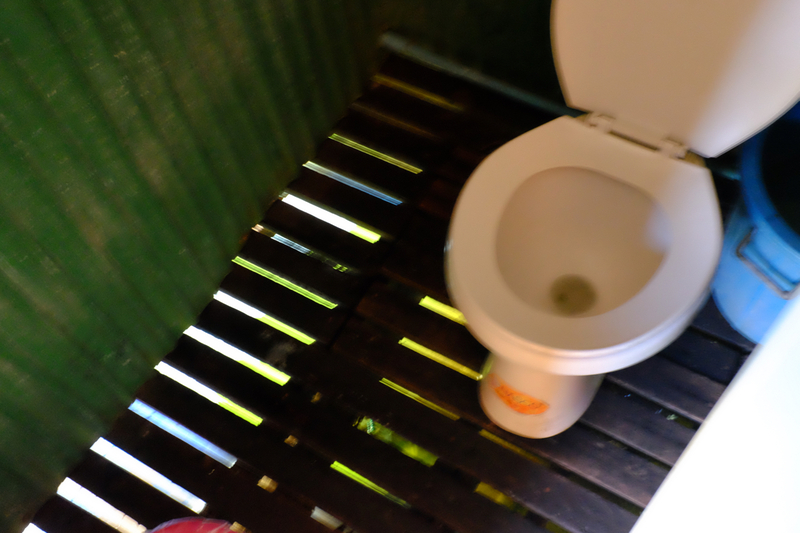 The bathroom lacked light and ventilation and was a haven for mildew. 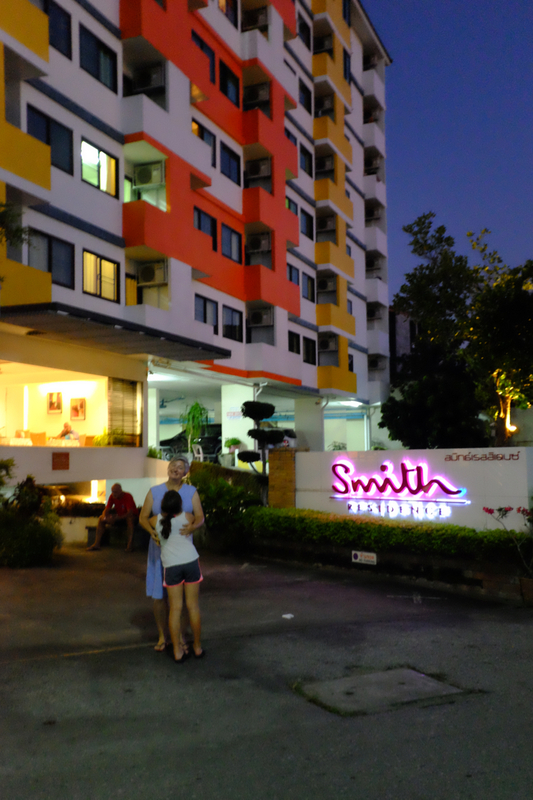 We spent a couple of nights there out of sheer laziness, then switched hotels. 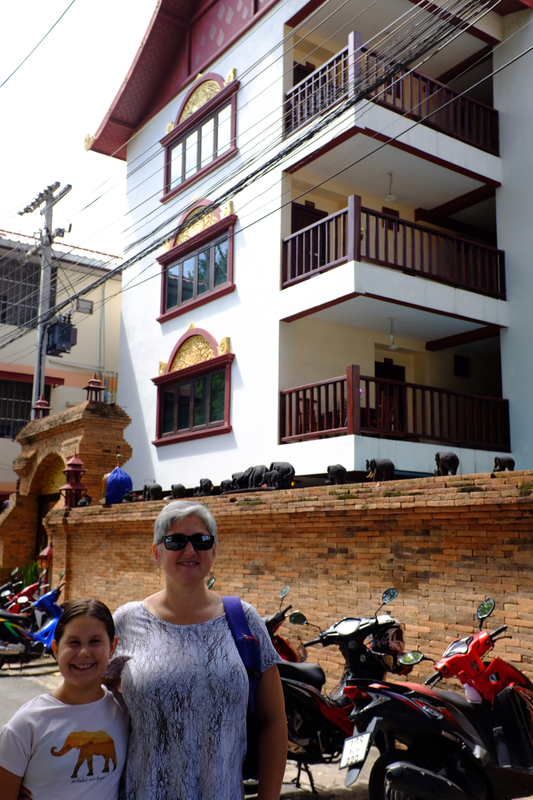 Chiang Mai, particularly the old city, is FULL of guesthouses and hotels, so there were quite literally thousands of options. 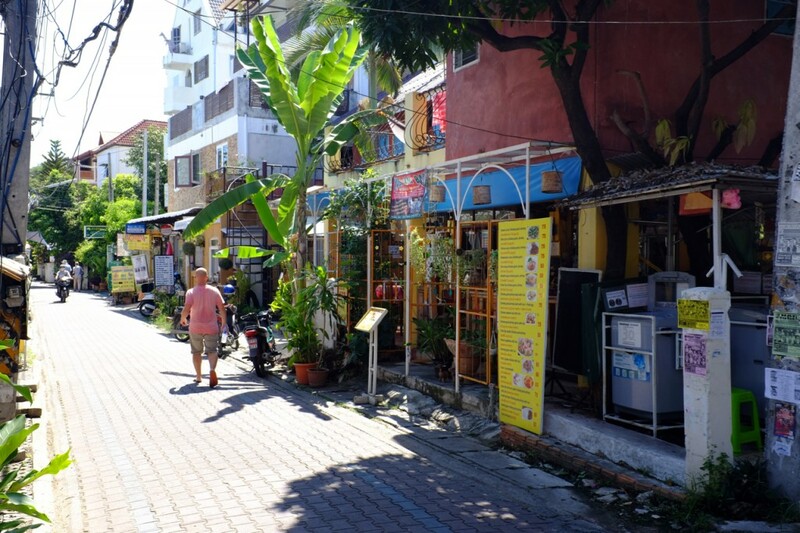 Sometimes it seems like every building in town is a guesthouse, backpacker cafe, thai massage shop, motorbike rental place, tour agency, cooking school, or all of the above. That’s pretty close to the truth in the old city and more touristy parts of town. 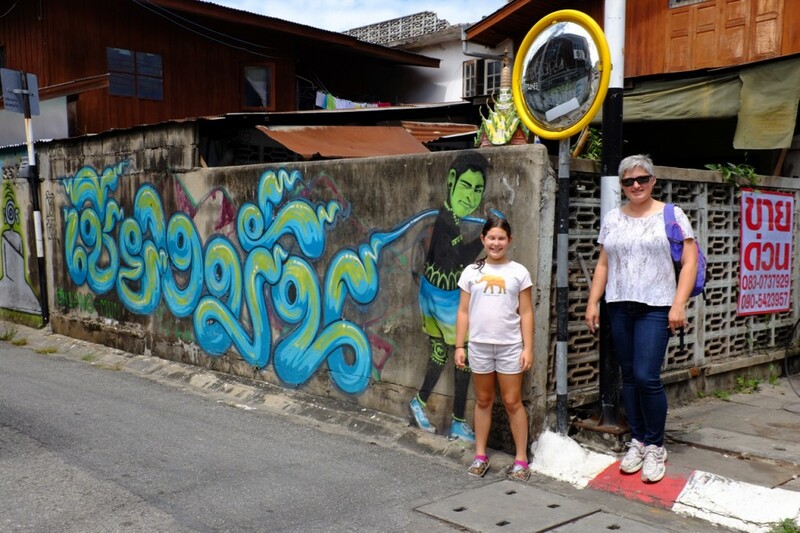 It would be quite easy to get “tourist overload” in Chaing Mai but somehow the town manages to retain a certain quaintness and charm. Lucky for us it is not yet high season, so while much of the town is touristy, there are not swarms of tourists…yet. The city is also quite spread out and suburban, and since we’ve stuck mostly to the touristy central neighborhoods our view of it has been limited. I think you’d need wheels – a car or motorbike or bicycle – to really explore and get to know the city beyond the typical tourist spots. We’ve been walking and taking songtaews, so our view has been somewhat limited. 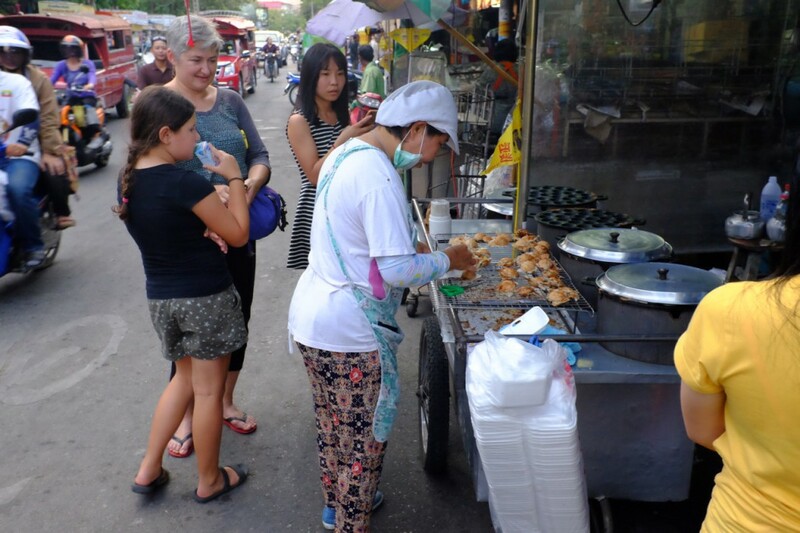 There are lots of westerners living in Chiang Mai, and lots of tourists too. The culture here reflects that. 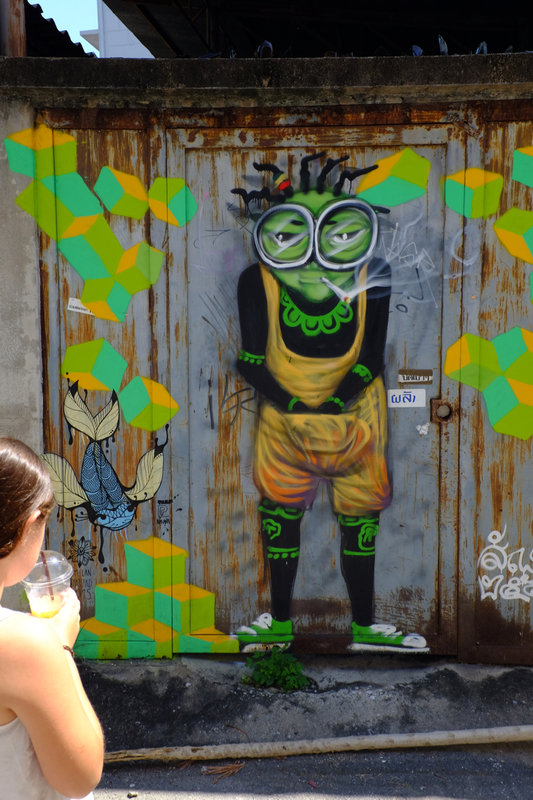 For example in the old city, you can see in the graffiti an appropriation of American youth culture, mixed with a local aesthetic. The neighborhood called the “old city” dates back to the 1200’s and was once a walled city with moats. The moats still exist, as do parts of the walls. The old city is easy to identify on the map. It’s the square in the middle! 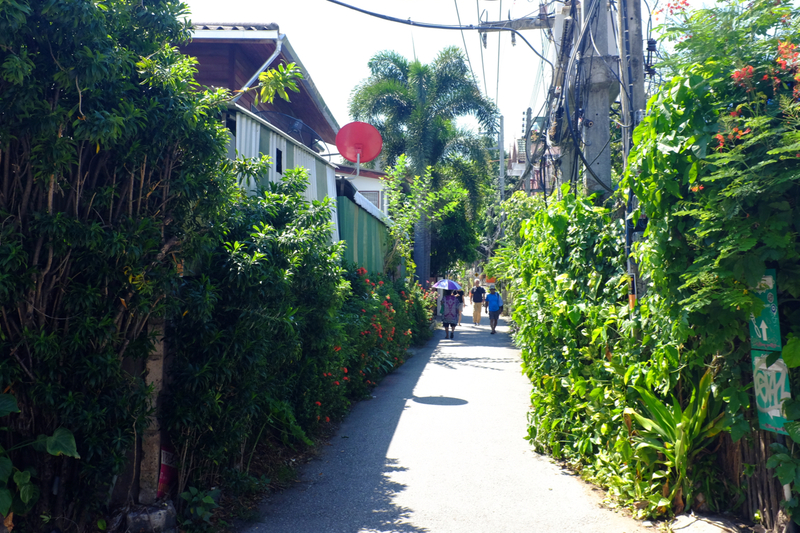 Much of Chaing Mai follows the pattern typical of Thai towns – streets lined with concrete shophouses a few stories tall. 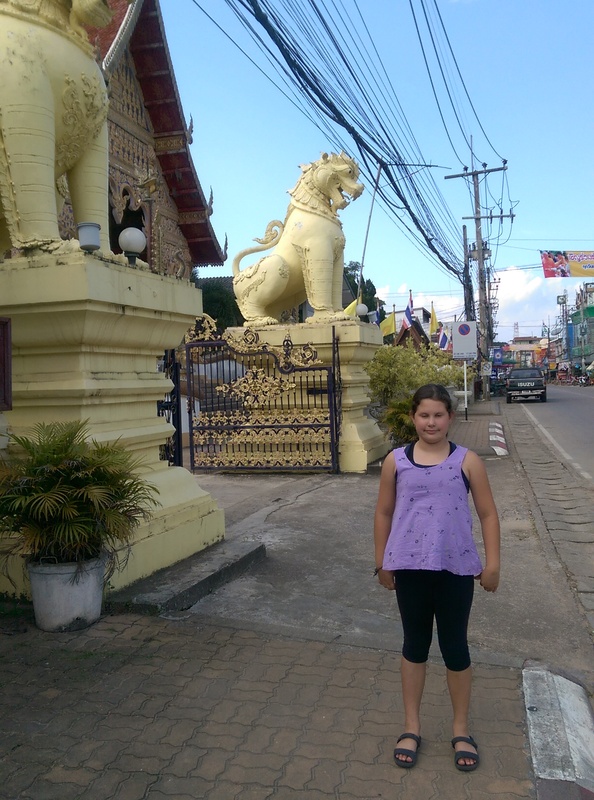 While there are some tall buildings, Chaing Mai is very much a low-rise city. In the old city, there are lots of cute little streets and alleys barely wide enough for one car and full of little shops, restaurants and hotels. In fact almost every home or building has some offering. It is a city full of little family run businesses. 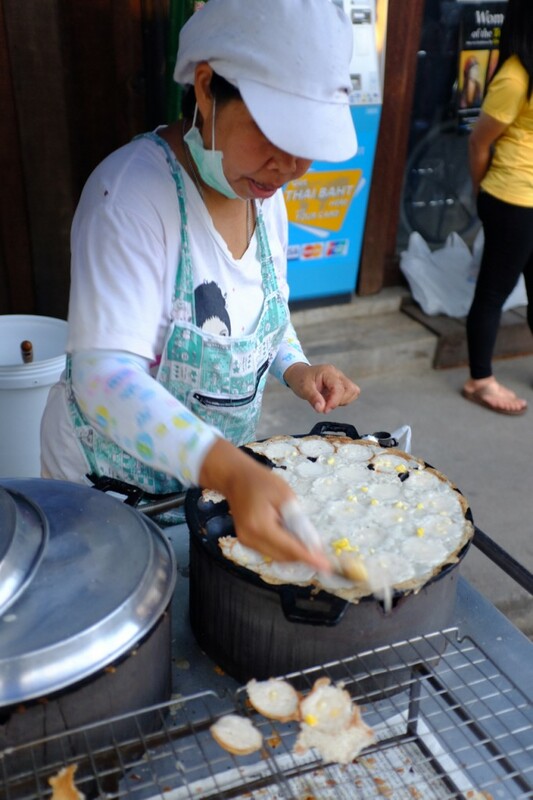 I really like this aspect of Chiang Mai and Thailand. People here don’t get jobs, they start businesses. I imagine American cities used to be a bit like this. 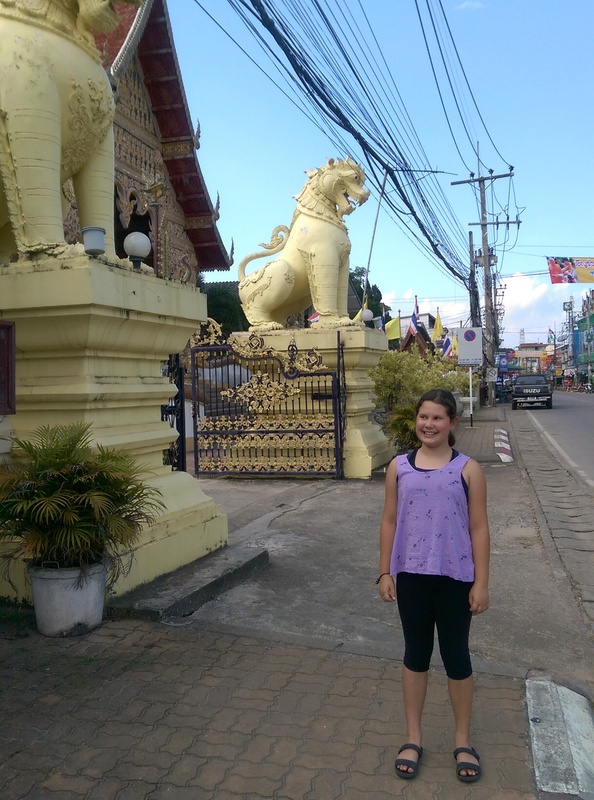 Of course there are lots of Buddhist temples in Chiang Mai. 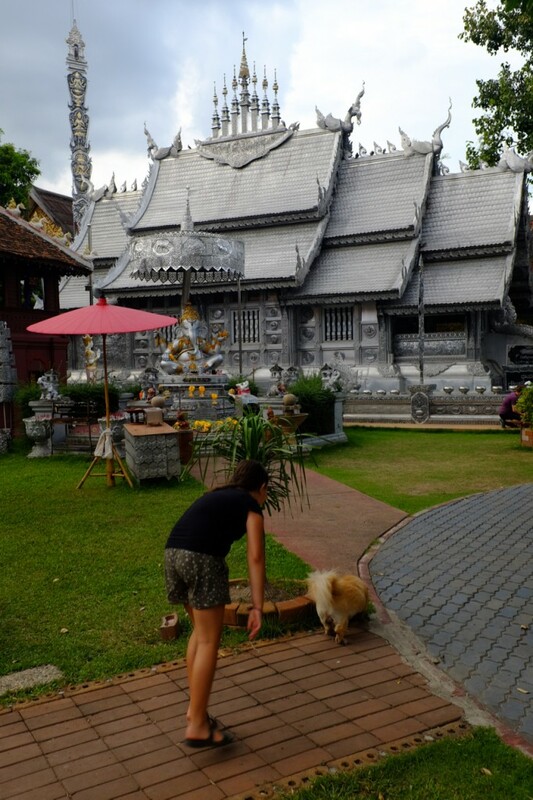 Where there are temples there are dogs to pet! 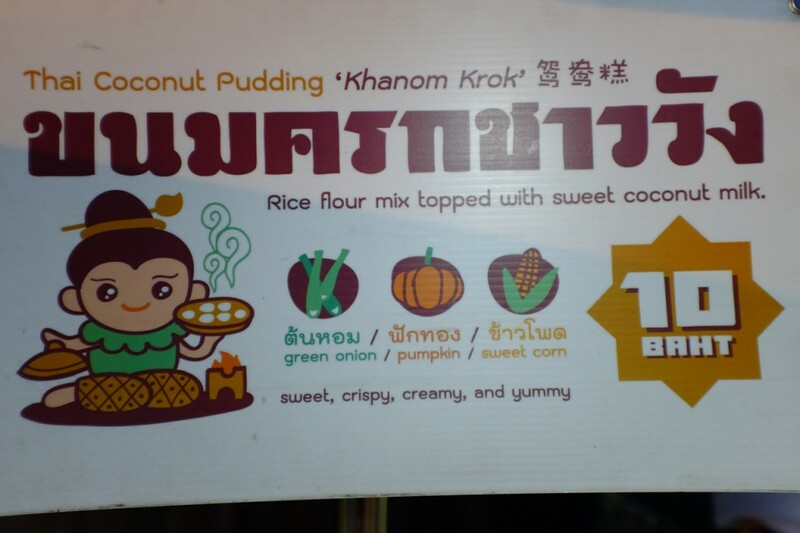 This is Thailand, so of course the food is awesome. 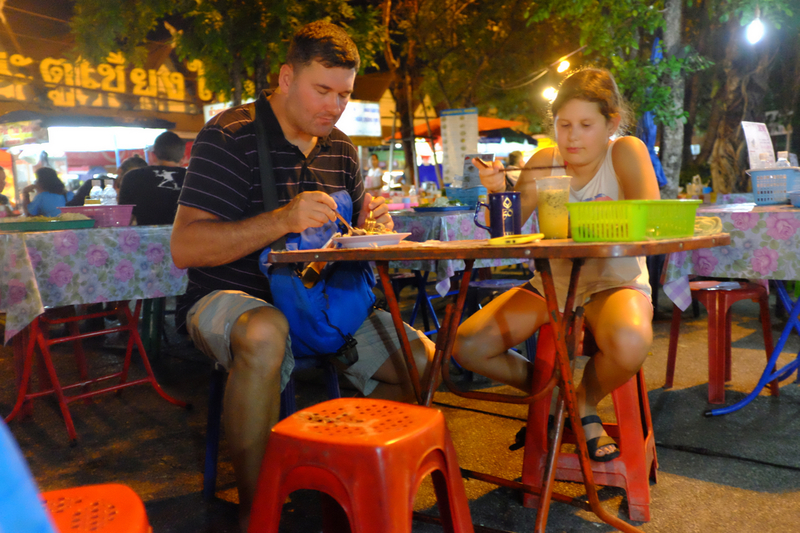 We’ve been enjoying the cafes, but especially the street food. 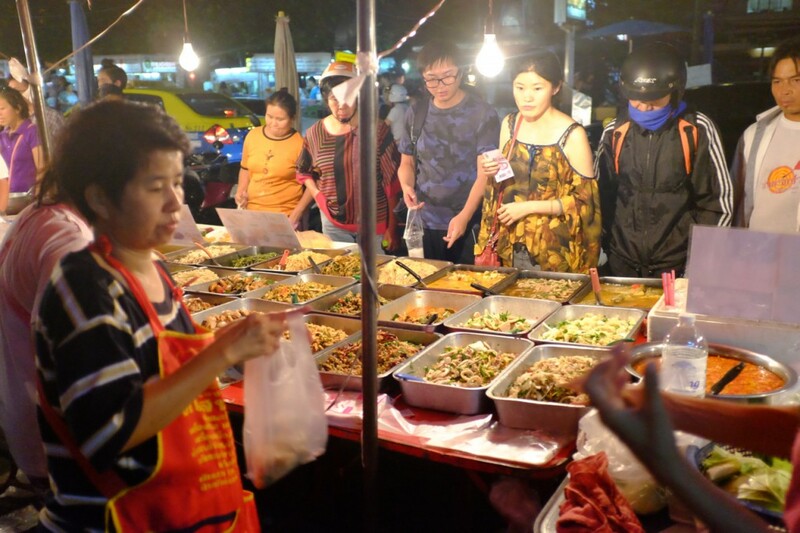 There is street food everywhere, and lots of markets where food carts and vendors set up in large groups, especially in the early morning and at night. That’s where you’ll find us! 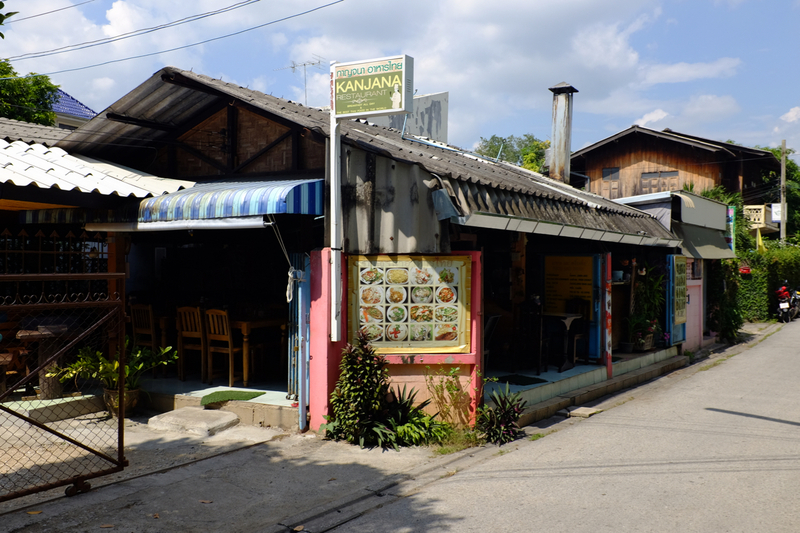 One of our favorite restaurants is Kanjana – a little place in the old city. It is a tourist joint, but really, really good. 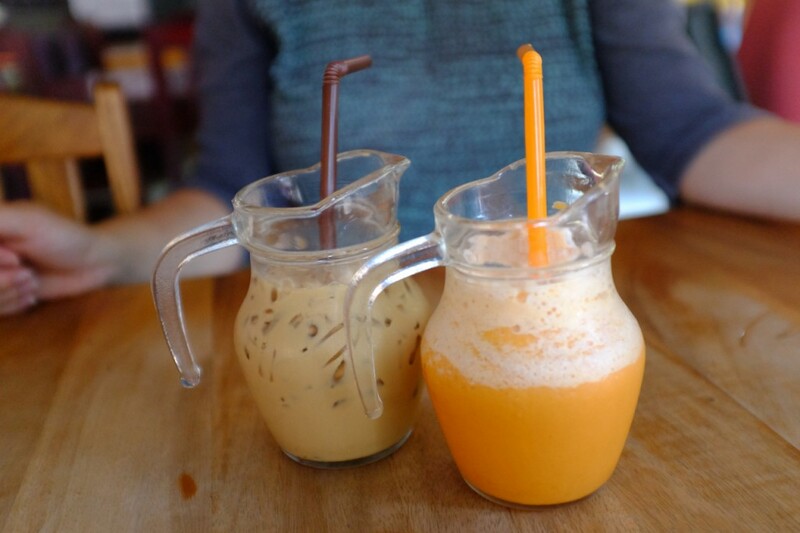 They tone down the “hot” by default, but will kick it back up to normal Thai levels on request (I like Thai hot), and everything is expertly prepared. Everything we’ve had there has been really good. 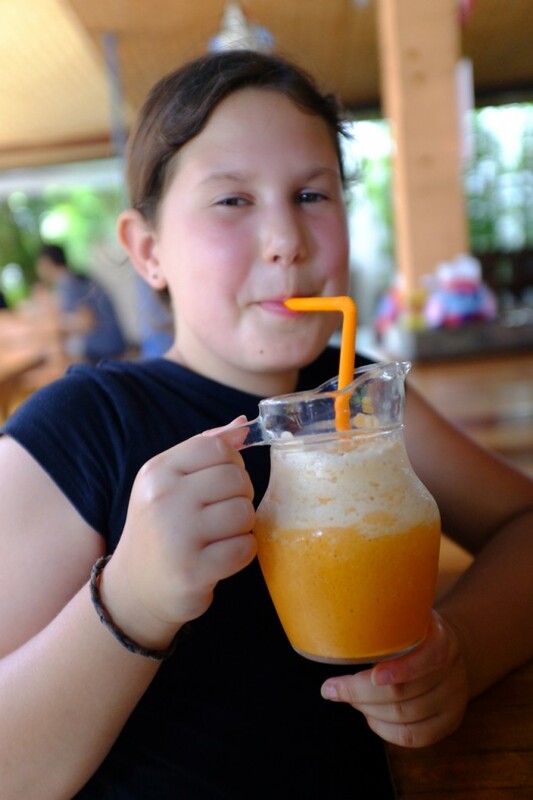 These must be silly straws! OK, enough about food. Typing this is making me hungry! Our second hotel was on the South edge of the old city, just outside the moat. It is big 8 story building and caters to long-term stays. You can book by the month and year, but they also have some rooms available for nightly rental like a typical hotel. 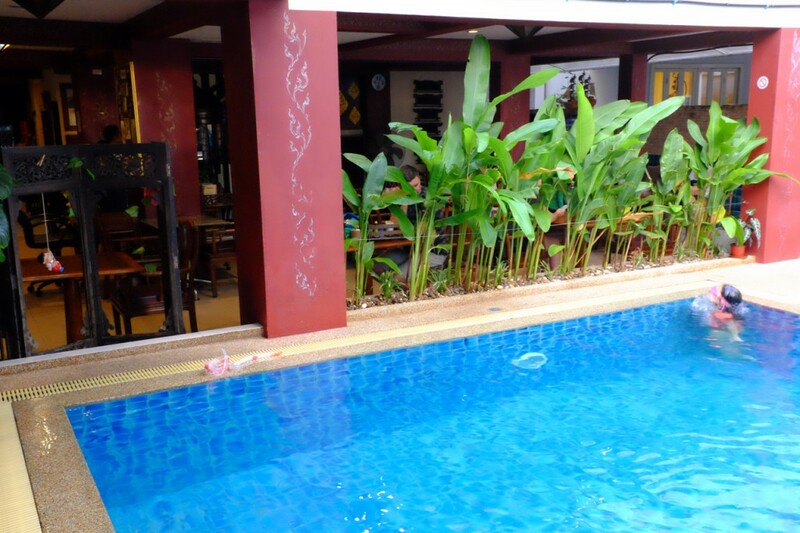 There are so many Westerners living in Chaing Mai, that these sorts of long-stay hotels and serviced apartments are quite common. There are lots of old western men staying there. Some appear to permanent or semi-permanent residents stretching their retirement dollars, others just in town for a while, perhaps for medical treatment. The owner of the building is a doctor and it seems that many of the residents are likely tapping into his services or referral network for medical care. Of course there are other tourists like us too. It is quite a comfortable spot. The room is big and spotlessly clean, and there is a pool on the roof. 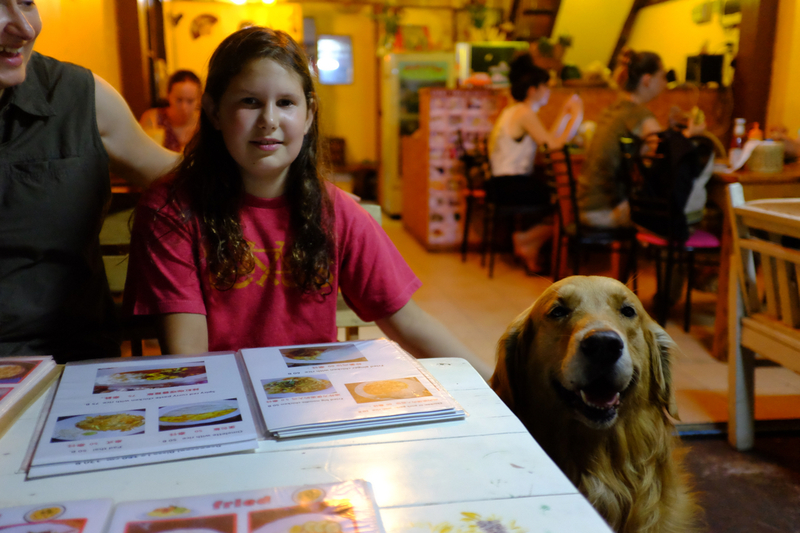 The restaurant downstairs serves scrambled eggs on a croissant, which Jette likes and is a nice respite from Thai food overload. 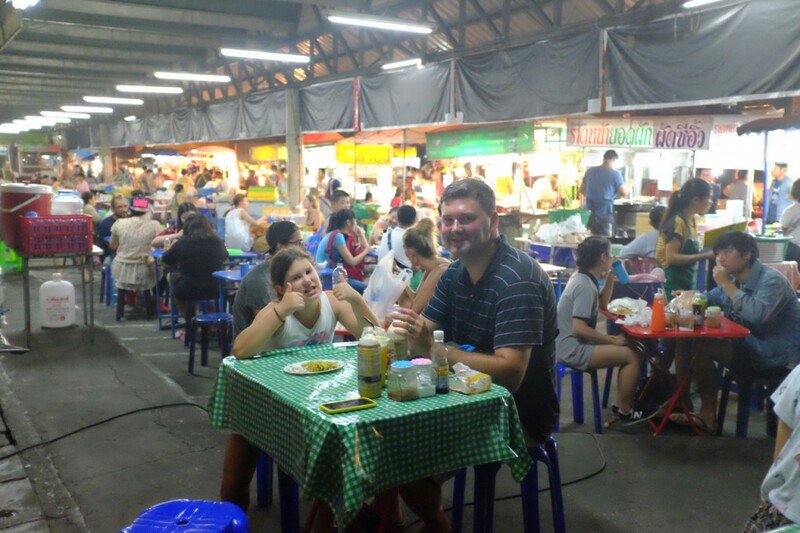 It is not really cheap like the backpacker dorms or really budget guesthouses, but it is not too expensive and we find it to be a very good value. 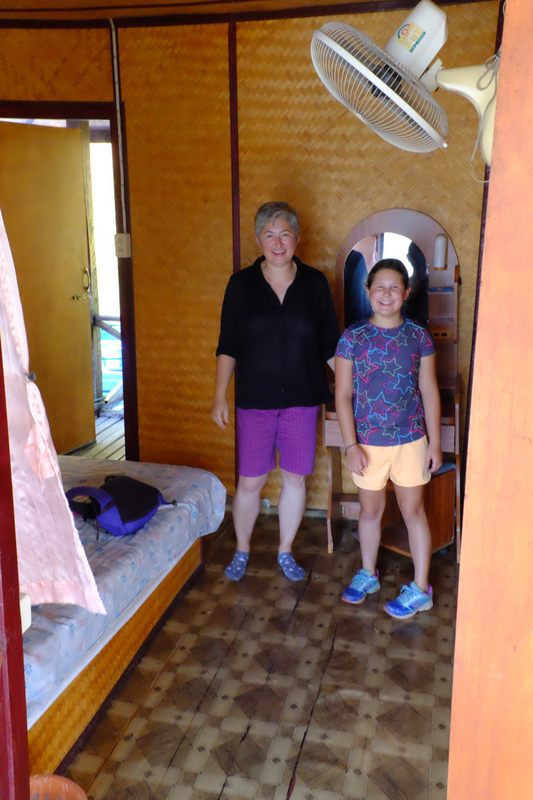 A nice, air-conditioned room goes for less than $25USD. That’s easily double what a fan room in a backpacker joint might costs, but it’s worth it to us. 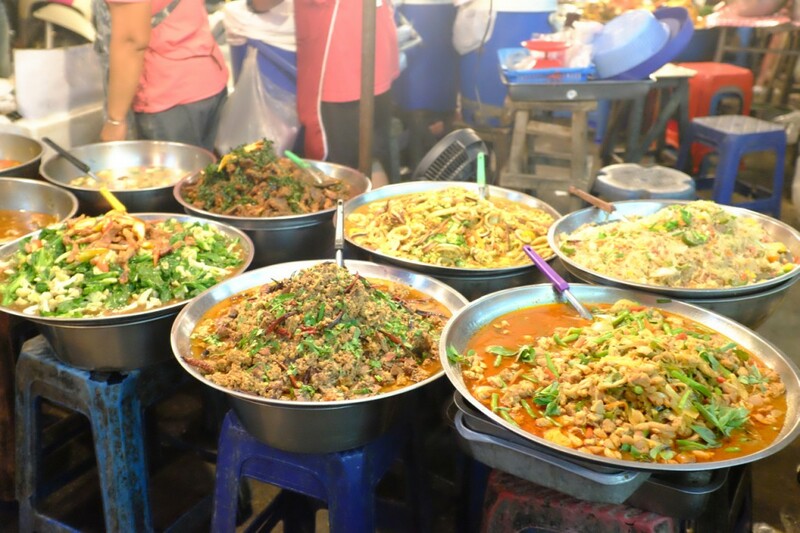 The location is great as we are just a block away from a great market with tons of yummy food options, as well as three 7-11’s. 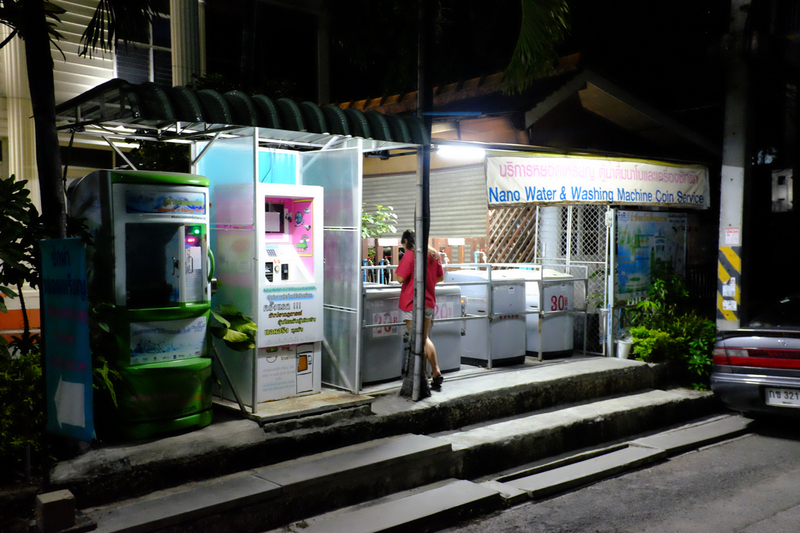 Yep, 7-11’s are everywhere in Thailand! 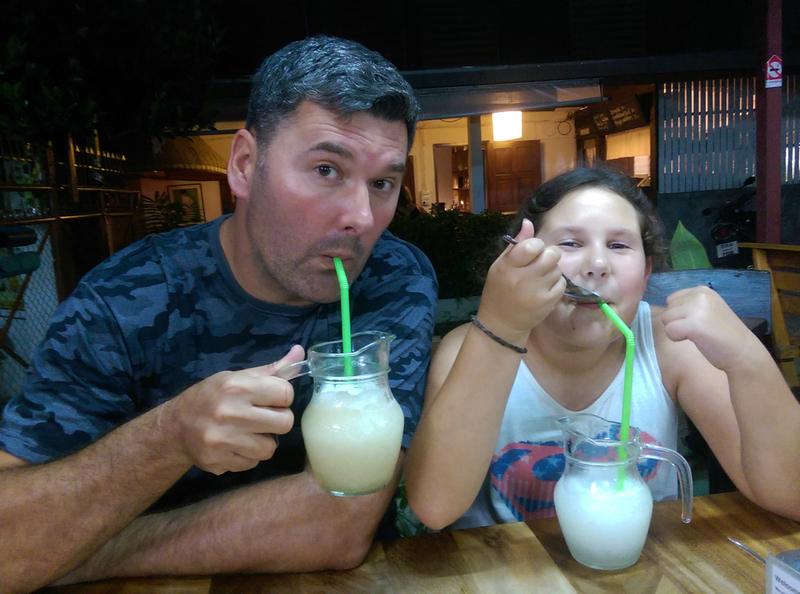 We’ve been having fun exploring Chiang Mai and we spent the first few days doing just that. 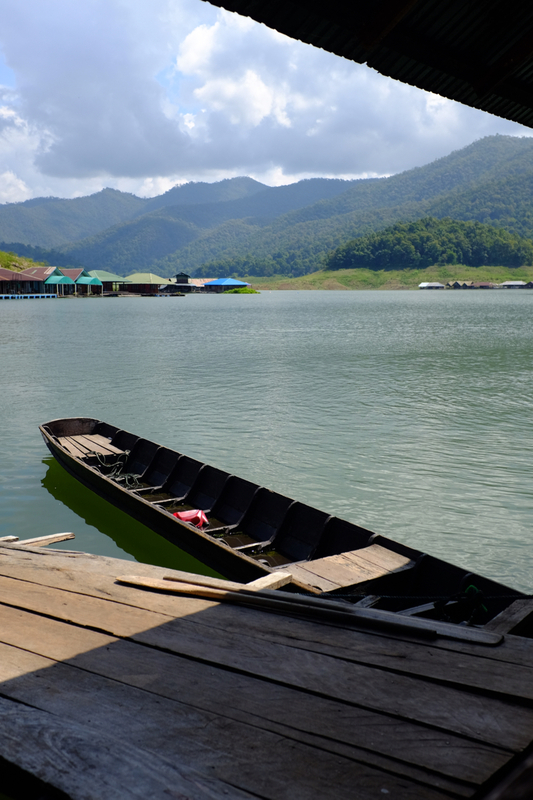 Although it is a bit cooler here in Northern Thailand, it is still quite hot and the sun is intense so it can be a sweaty enterprise! 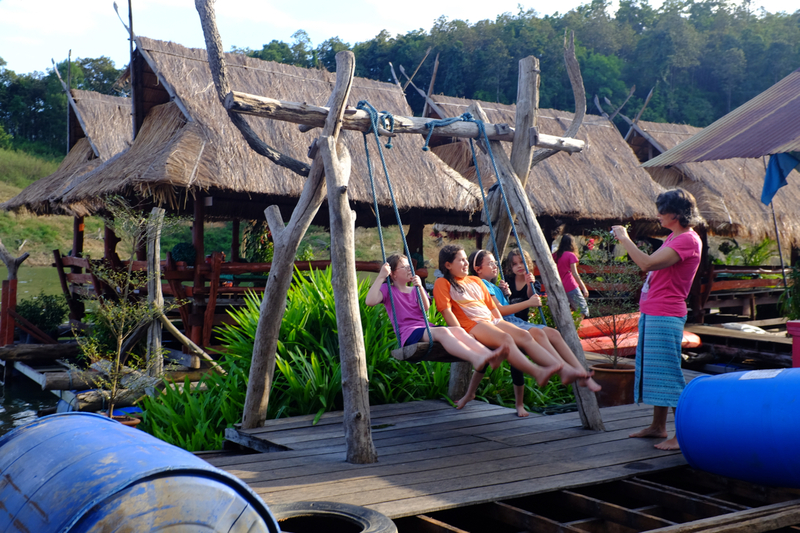 We’ve been enjoying the cheap and abundant Thai massages. An hour long foot massage is often less than $5 USD. 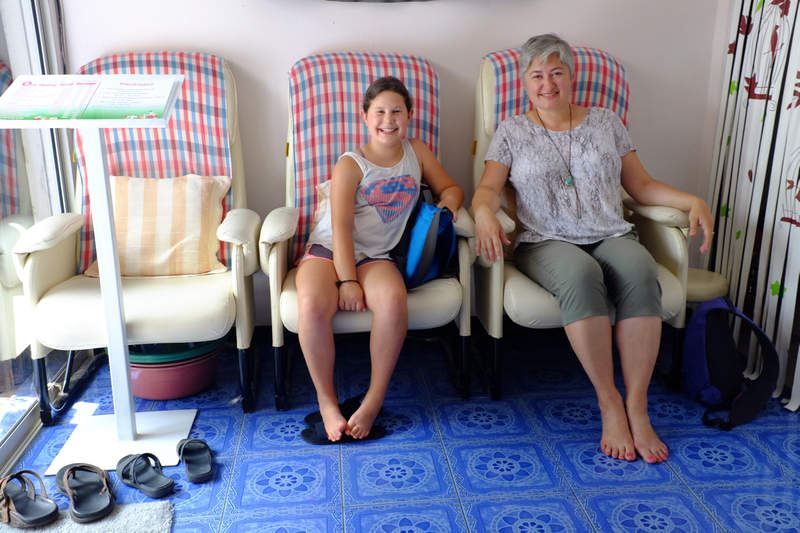 Mila and Jette have stopped for foot massages a few times, and I’ve been on a quest to find the best traditional Thai massage. 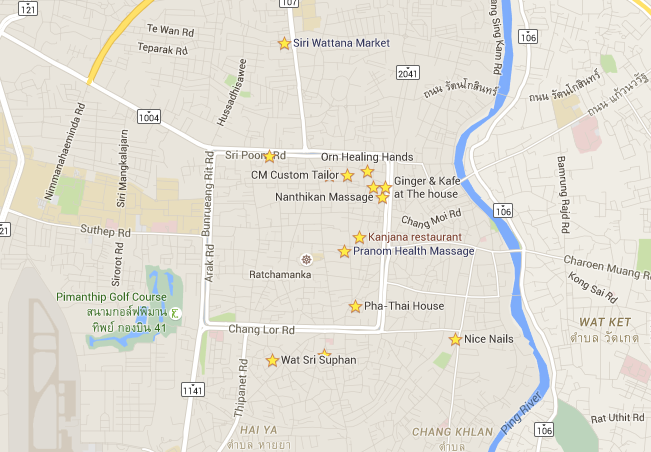 With my broken back, a good Thai massage can be quite a relief. A bad one could probably be dangerous. 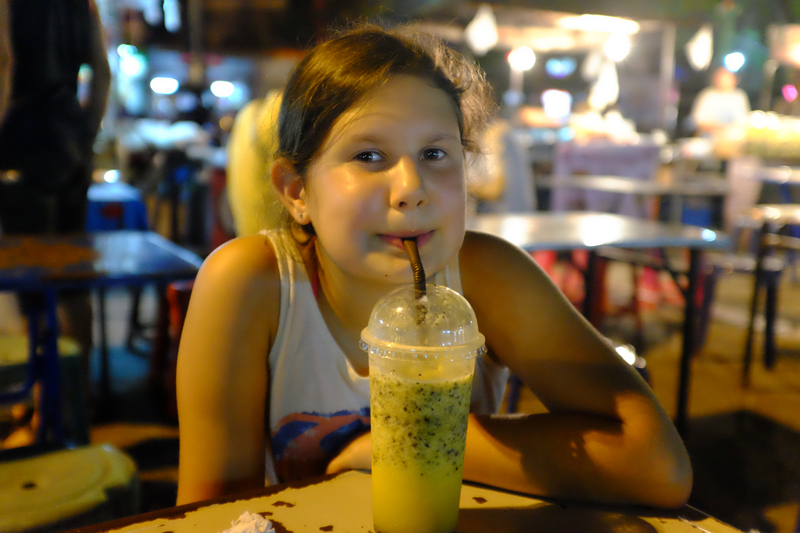 Here in Chiang Mai, we’ve been to two places that are very good. Nanthikan Massage gets my vote for the best. The owner, Nantihkan, gave me one of the best Thai massage I’ve ever had. 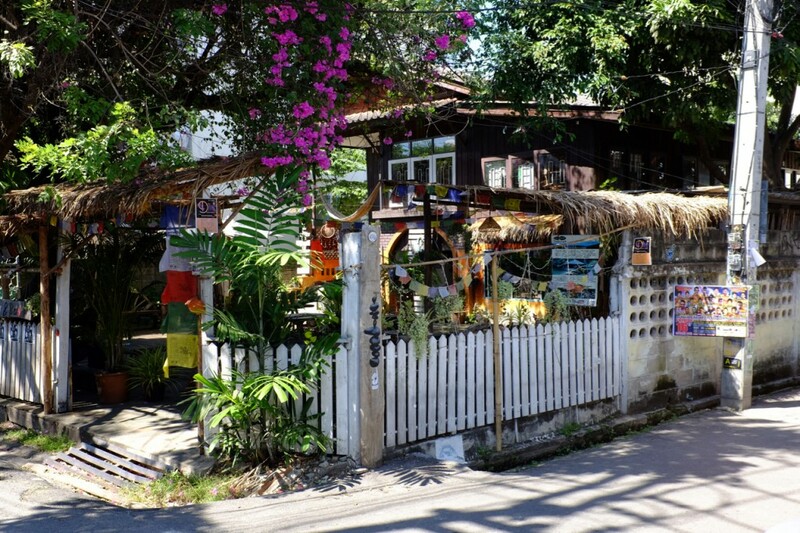 Back in the early 1990’s I took a ten day massage class at the Wat Po medical school in Bangkok and Nantihkan’s massages are as good as the teachers there. The other place that is quite good is Om Healing Hands. 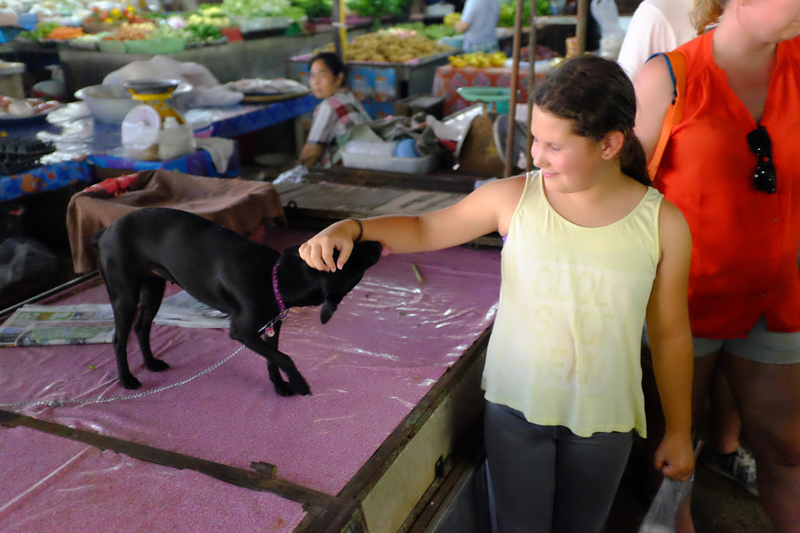 Massages, delicious Thai food, beautiful temples, and lots of dogs to pet. We’ve been living the good life. But there is more! 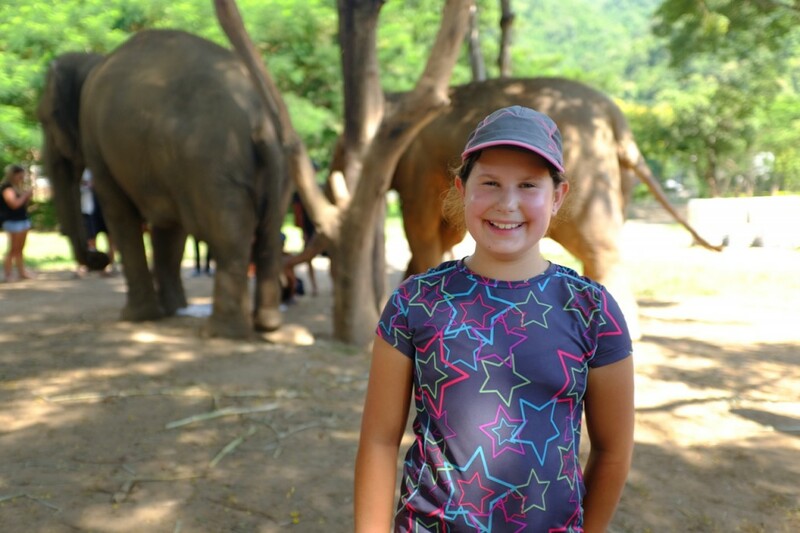 We went to an elephant sanctuary and learned about elephants and their plight in Thailand. 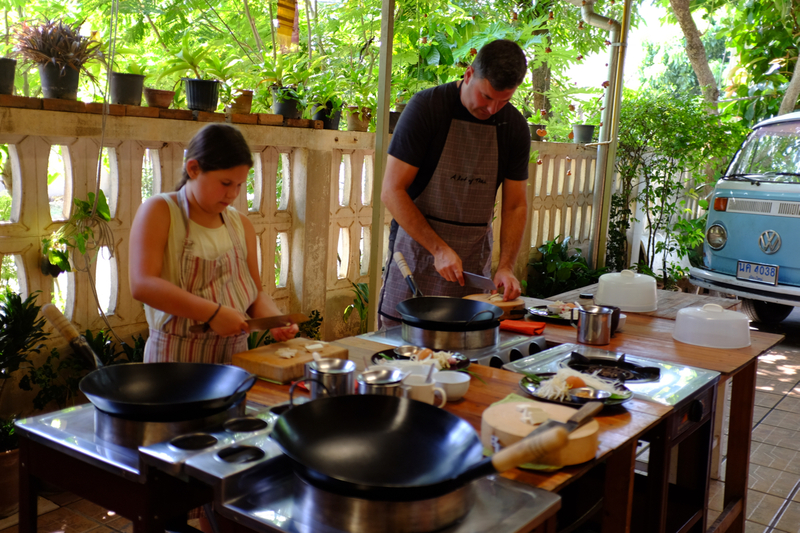 We took a fantastic Thai cooking class. 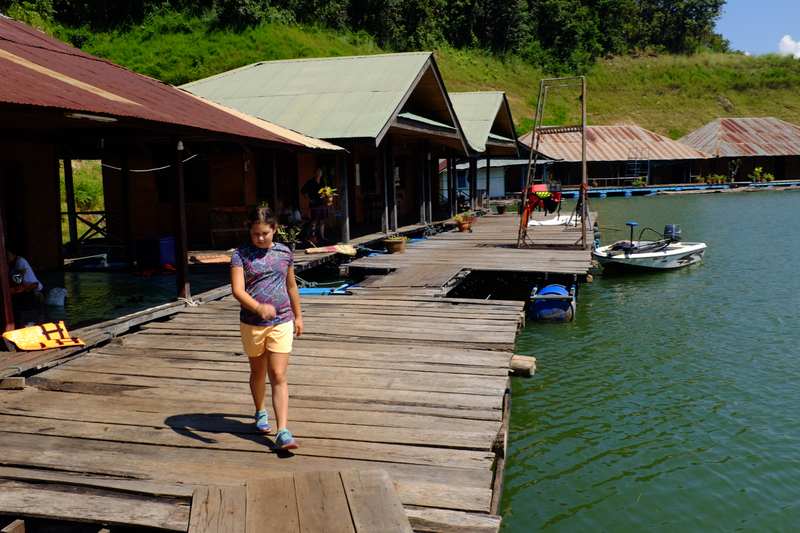 We went off the tourist path to a nearby national park and stayed at a floating hut on a lake.